Jessicahttps://capersincooking.wordpress.comI am a native Floridian with a love and passion for all things that emerge from the sea! I am married with two amazing little boys. My father founded Cod & Capers Seafood when I was a baby. I joined the Cod & Capers team in 2006, after several years of marketing and hospitality experience. In my spare time, you can find me making a mess in the kitchen or at the beach! We had Rock Shrimp on special in the Market last week. It prompted a conversation with a friend in which Shrimp Cakes were mentioned; I realized it had been quite some time since we have made Shrimp Cakes. 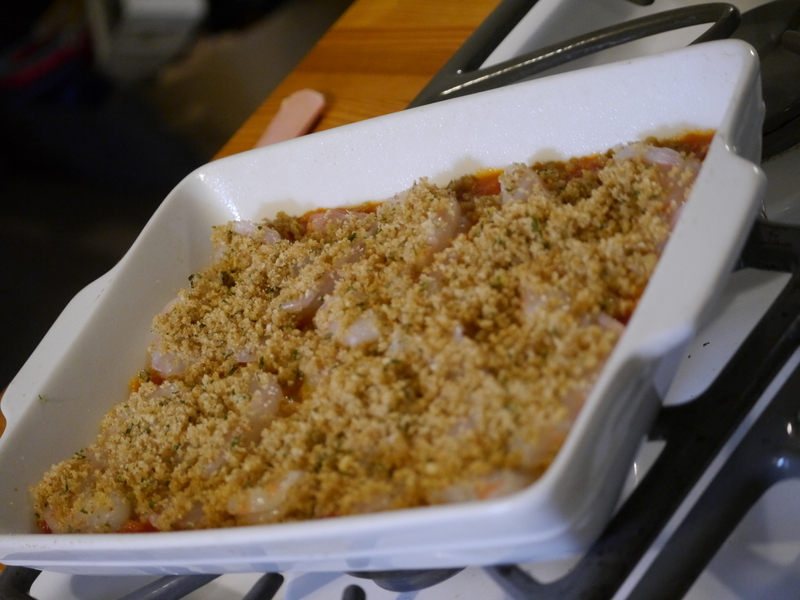 Shrimp are already so versatile and this is just one more way they can be prepared! I used Rock Shrimp for this since they were already peeled and deveined (and they’re small, so you’ll do less chopping). Some people may opt to put the shrimp in the food processor; I really like seeing big pieces of shrimp, so I just chopped them with a knife. 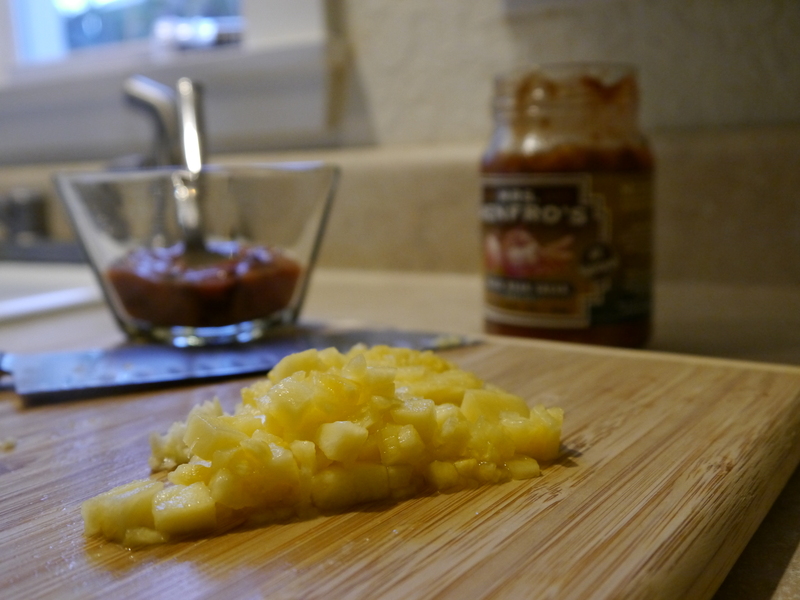 Start by making sure there are no stray bits of shell in the shrimp and roughly chopping them. Put them in a large mixing bowl. Mix until combined and make sure that everything is evenly distributed. Form handfuls of the mixture into cakes. You need to firmly compress the cakes so they hold together. 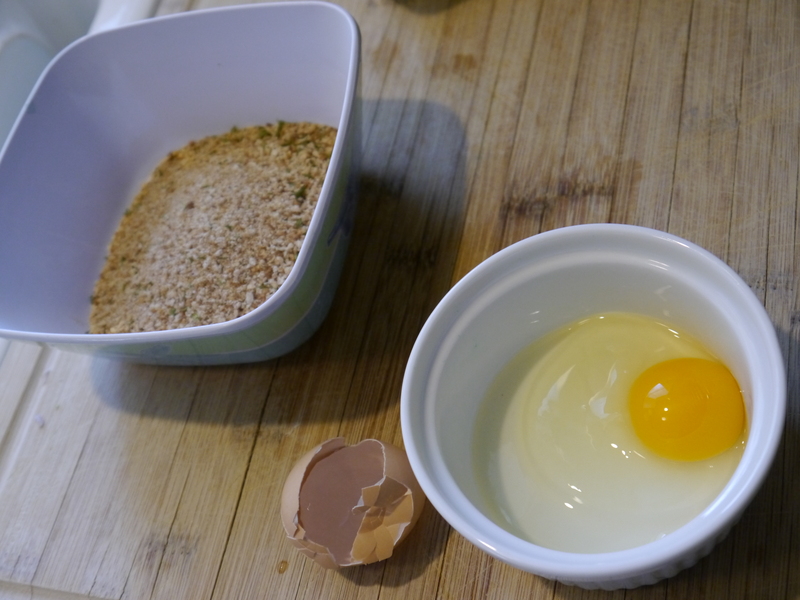 The eggs and breadcrumbs sort of act like glue to hold everything together, but they will be fragile until you introduce heat. I made ours into six smaller sized cakes. 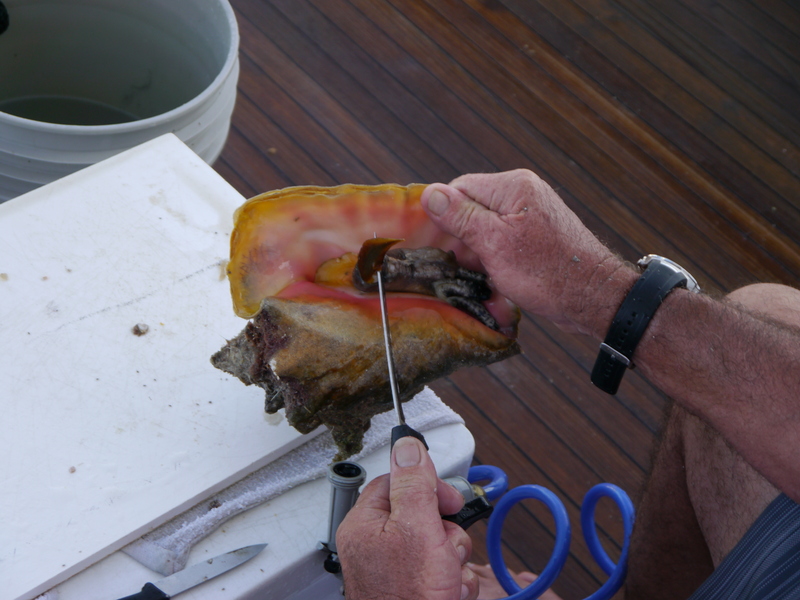 You want them to be thin enough that they will cook through fairly quickly, but not so thin that they will fall apart. 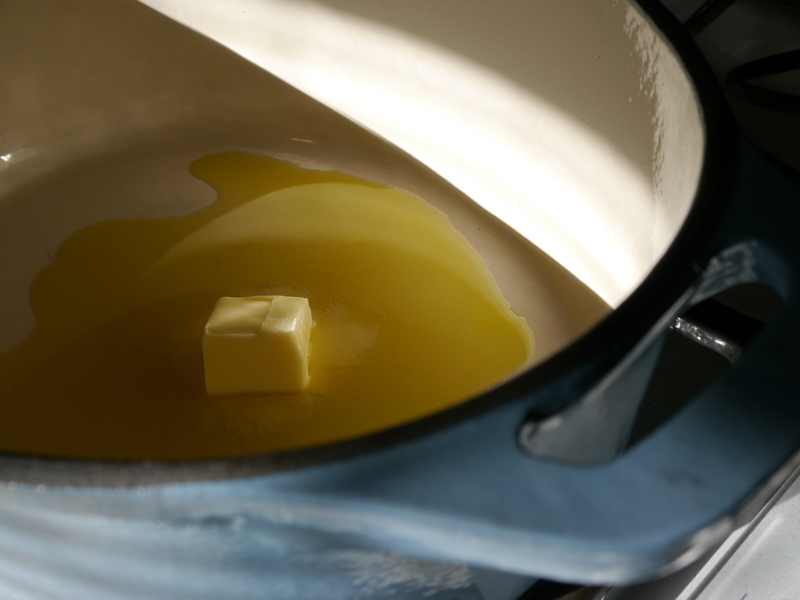 Heat the Olive Oil (or oil of your choice) over medium heat and then carefully add the cakes to the pan. I cooked them for about 5 minutes on each side over medium heat. When you see the shrimp at the bottom turning opaque and the egg is holding them together, it is safe to carefully flip them with a spatula. It’s very important NOT to disturb them until it’s time to flip them. Until the egg starts to cook, they will be fragile; once the heat starts to cook the egg, they’re fairly sturdy. When I flipped them, they were perfectly browned and crispy! 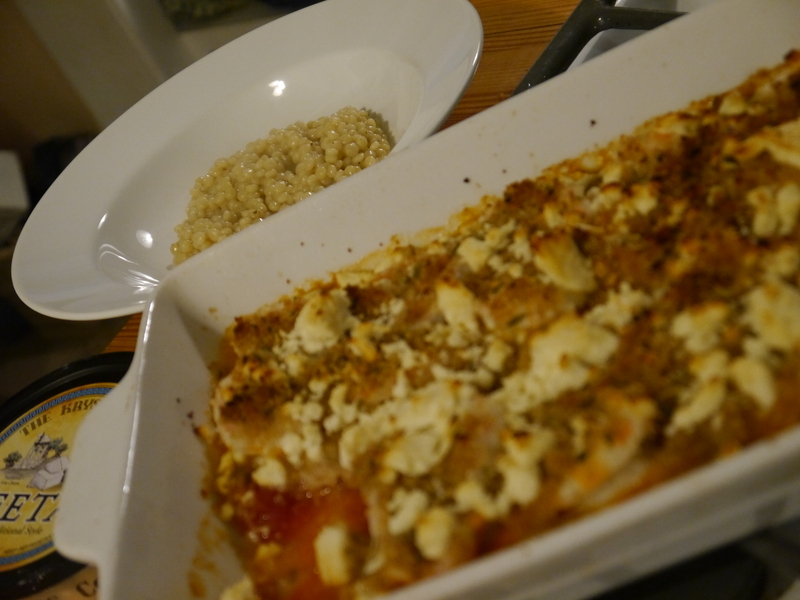 We decided to top them with some homegrown tomatoes from the garden and more chives. You could use ANY sauce with these… Tartar Sauce, Remoulade, Aioli, etc. We all love the Mustard Sauce from the store. We used the Mustard Sauce because it saved me some time, but a spicy mayo (Sriracha and Mayonnaise mixed together) would have been great with the smokiness from the Paprika, too! 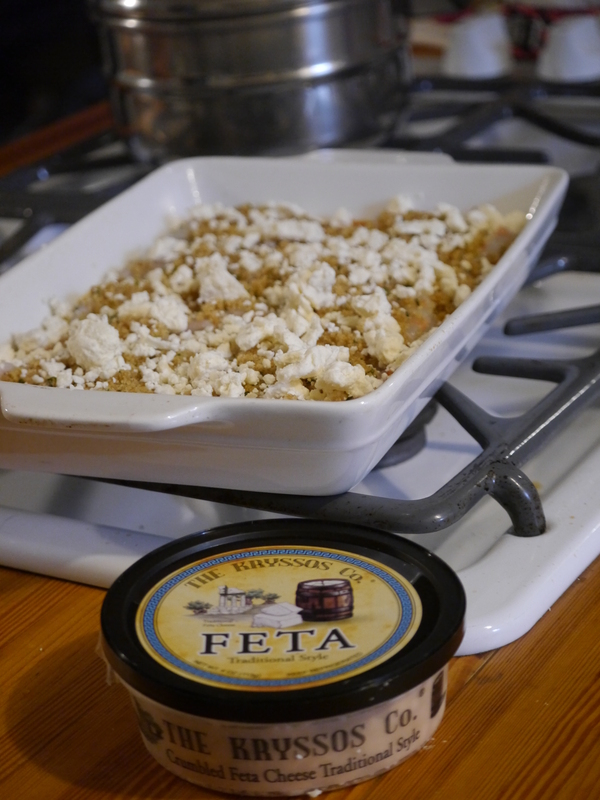 This could be EASILY converted into a gluten-free recipe with the substitution of a gluten-free breadcrumb. You can also adjust the seasonings. 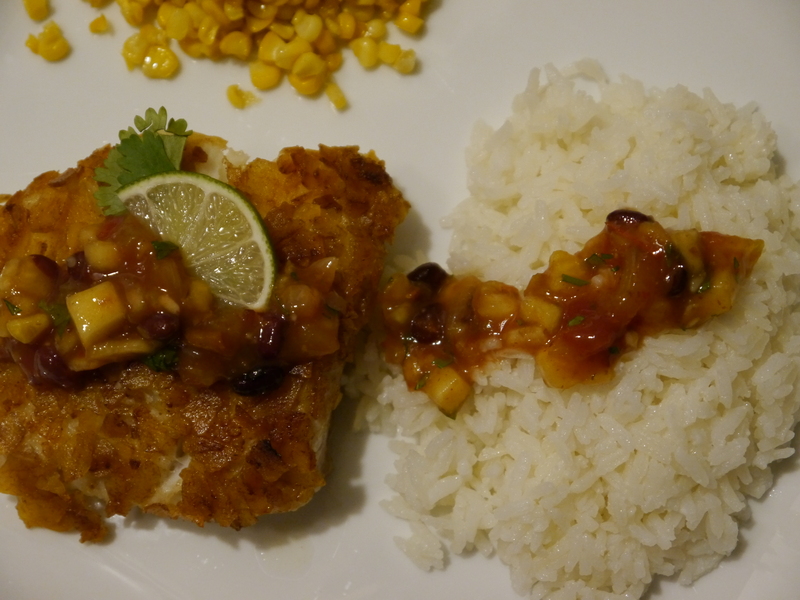 This is a very quick and easy dinner that the entire family will enjoy! Catching up… and getting back to basics. You might not be exactly sure what this has to do with seafood, but stick with me and you’ll see. 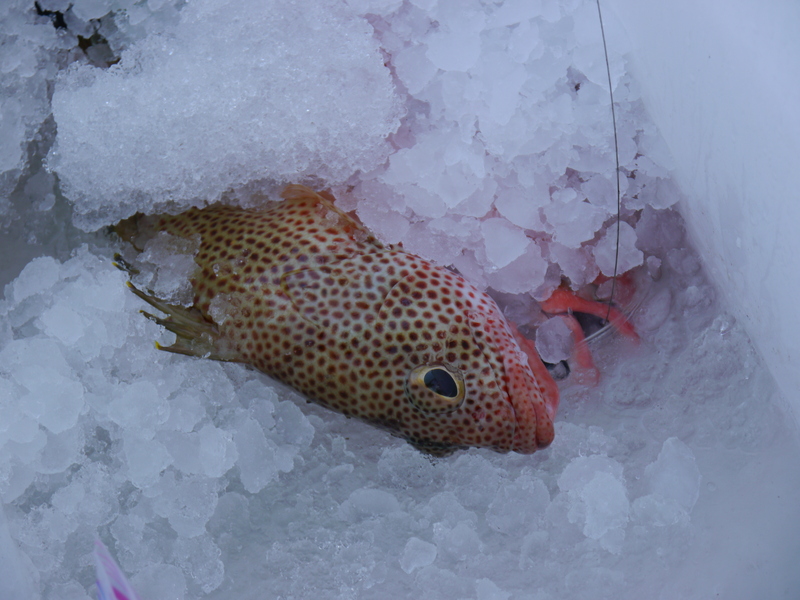 One of the things we push at Cod & Capers is: know where your food comes from. Ask questions. Eat local when possible. Great ingredients don’t need covering up, fancy sauces, or coatings. It’s hard to believe that it has been almost two whole years since we have posted here! Far too much time has gone by. We moved to a new home, joyfully accepted the added responsibilities of caring for ill and aging family members, and have been busy with life in general. We have also sadly experienced the overall upset that occurs when a family member is faced with serious health challenges. Life has been a little bit difficult lately and I hate to admit it, but nothing fancy (or even blog-worthy) has been happening in this kitchen for quite some time. We have a Meyer Lemon tree that gave us over 200 pounds of lemons this winter. (Seriously… look at all the Meyer Lemons on this tree!) We made everything from Lemon Marmalade to Lemon Curd (and enough Lemonade Concentrate to last two kids at least a year) and then I taught them how to can it so it stays preserved until next time the tree gives us lemons. 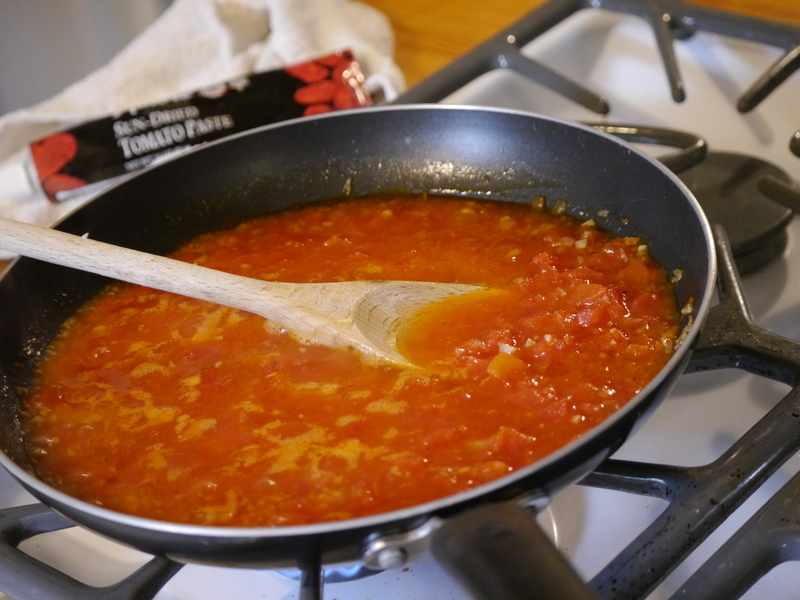 We even made (and canned) Salsa and Marinara Sauce from their homegrown tomatoes. The boys have really learned a lot in the last two years. Florida Strawberries are in season right now, so we made our annual batch of jam (enough to get us through until next year). Normally, I would compost the green tops of the berries. This year, we soaked them in vinegar and made Strawberry Vinaigrette by reducing the vinegar and adding sugar & lemon juice (the result was a ton of salad dressing from something we were going to THROW AWAY). You may remember from previous posts that we have kept hens (for eggs) for over ten years now. 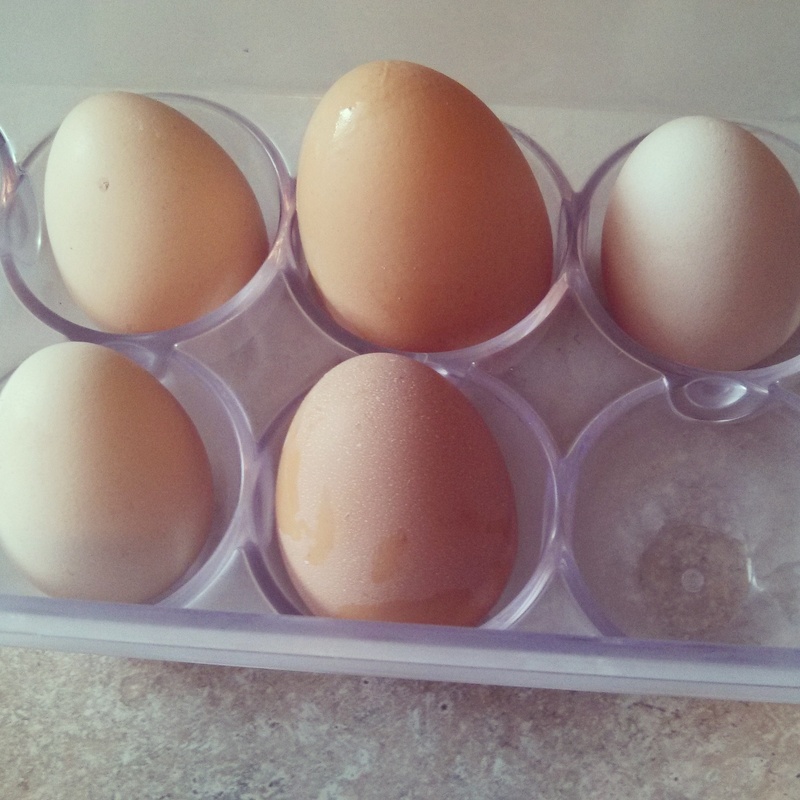 During the last year, we added more chickens to our flock and even started hatching our own! Something we have been trying to remind the boys of is not to be wasteful. A question that came up when hatching our own chicks is what to do with the males that will not be providing us with eggs. After some thoughtful discussion, the boys decided that they would like to raise them for meat. 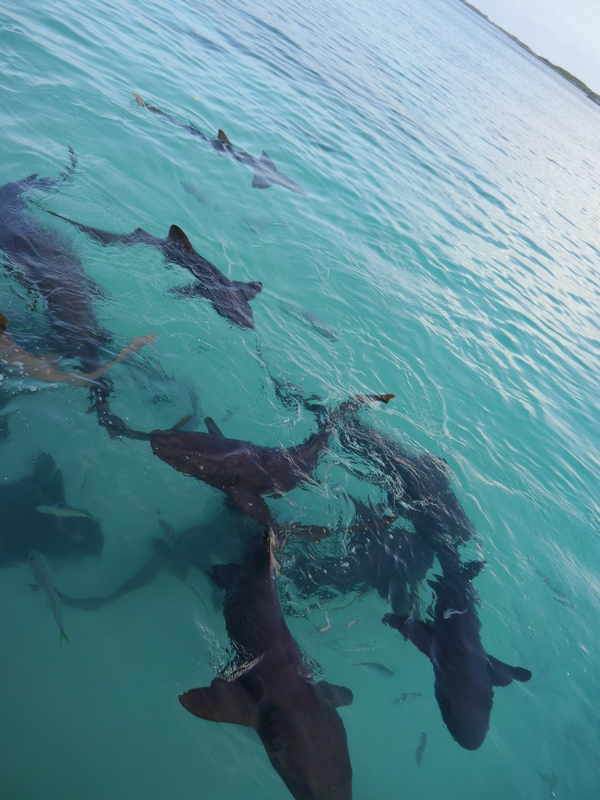 We are willing to give them all the experiences they are open to, so we made a go at it. We raised the first two roosters that the boys hatched themselves until they were around 14 weeks old, at which point we decided to cull them. Not only did this yield a completely delicious chicken dinner, but it was another excellent lesson in using ALL of what is given to us. We used the entire animal. 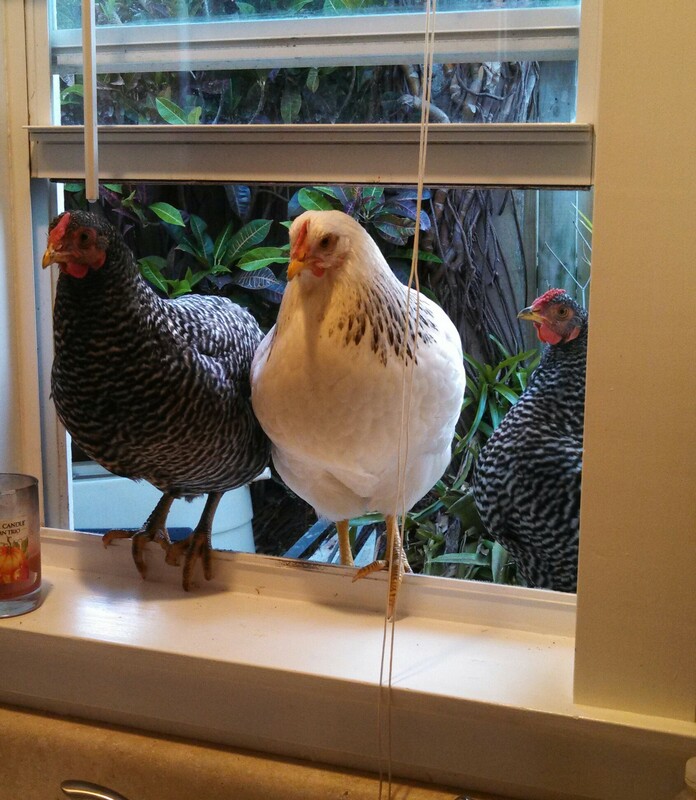 I made over 8 quarts of stock with just two roosters, they ate chicken for dinner… everyone was happy. I am thankful that they were able to experience hatching, raising, and caring for an animal before having the opportunity to see that chicken doesn’t just come from a package in a grocery store. 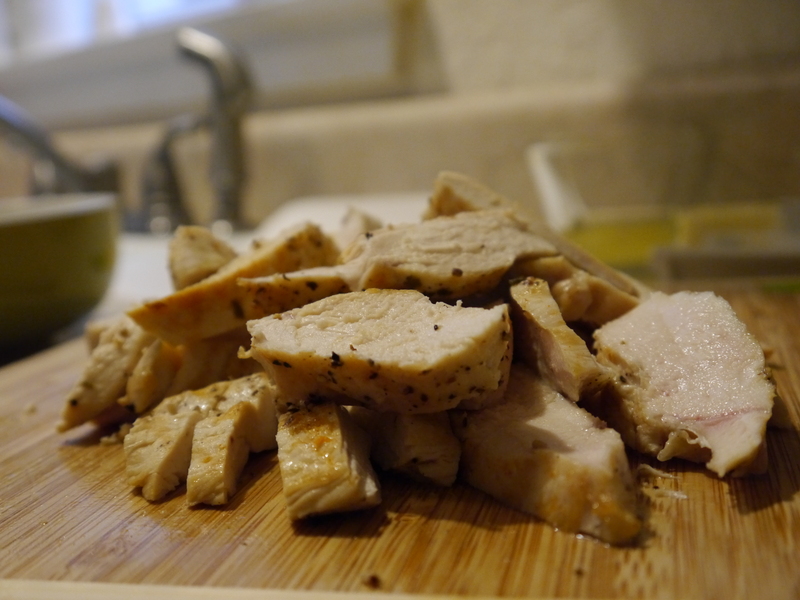 My favorite way to grill chicken is to remove the backbone and flatten the chicken. (The best part is that I got to use the backbone for stock!) We marinated one with garlic, sliced Meyer Lemons, and fresh Rosemary. We left the other one plain and slathered it with BBQ Sauce while it was grilling. A meal this special called for homemade Macaroni & Cheese, Buttermilk Biscuits (with homemade Strawberry Jam), and a Spinach Salad with our Strawberry Vinaigrette. So what does it all have to do with seafood? Well, not much… but the moral of the story is that it’s important to take a step back once in a while and really SEE where our food comes from. Spend an extra hour in the kitchen making jam instead of buying jelly… even if it’s just once. When I see how hard a fisherman has to work to bring in a load of fish or how hard an aquaculture farmer has to work to harvest just one shipment of fish or shrimp, it makes me appreciate every morsel we put on our plates. Food is more than something that comes out of a package from a supermarket. Whether it’s wild, farmed, or homegrown… take the time to really appreciate it and give thanks for it. Don’t be wasteful. We can all take a lesson from our grandparents and get back to basics. 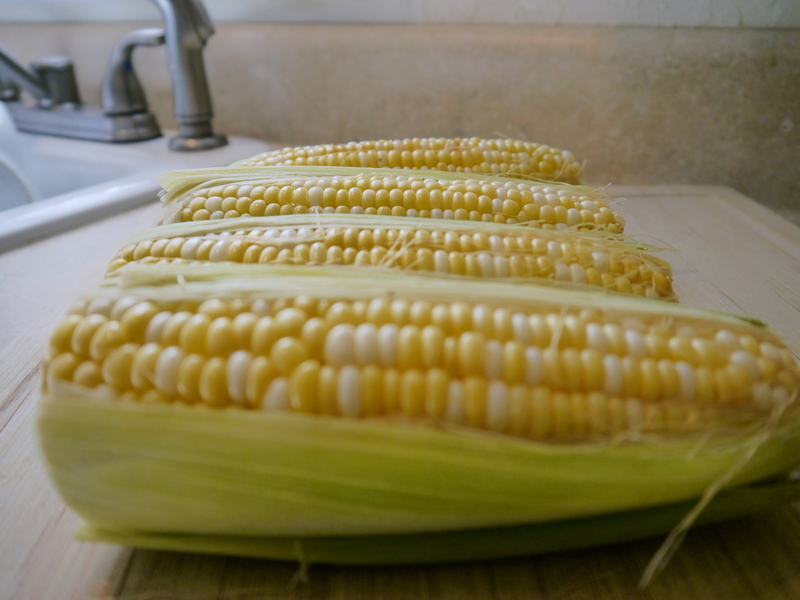 If you’re from South Florida, you know that Summer is the BEST time for local corn. It’s absolutely unbeatable. I’ve been known to buy a crate at a time and freeze it to have year-round, because it is just THAT much better this time of year. Something else that is great in Summer? 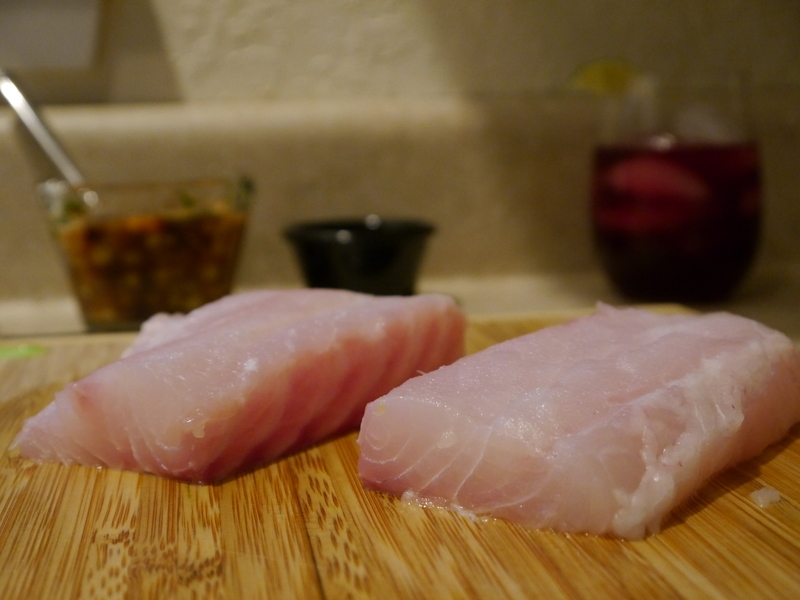 Halibut!! Since it comes from Alaska, it is not readily available year-round. 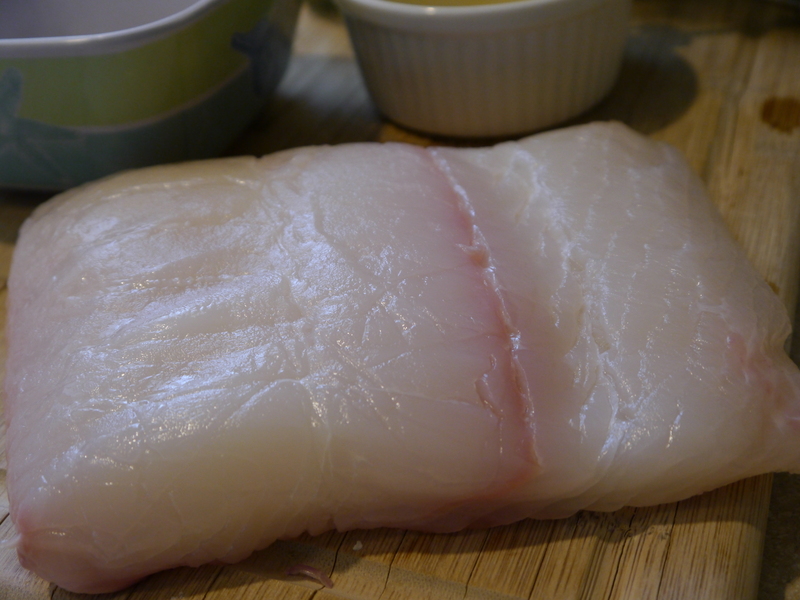 Spring and Summer are the perfect time to enjoy our Alaskan favorites such as Halibut and Wild Salmon. 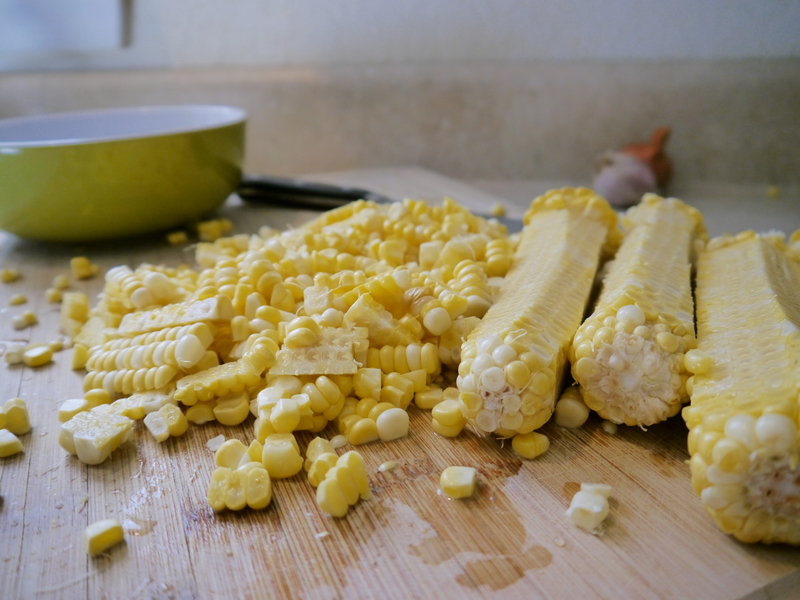 Start by removing the corn from the cob and gathering the rest of your ingredients. 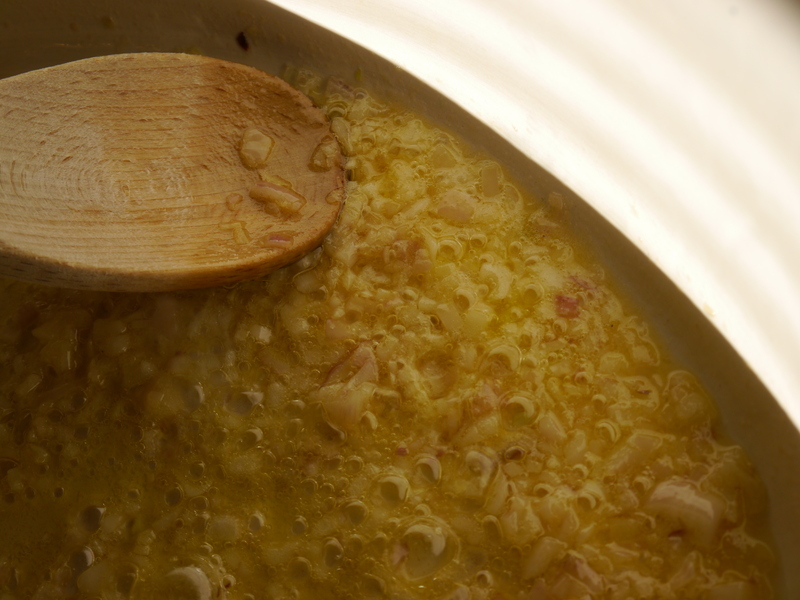 Warm the stock over low heat – keep it on the back burner during this entire process. 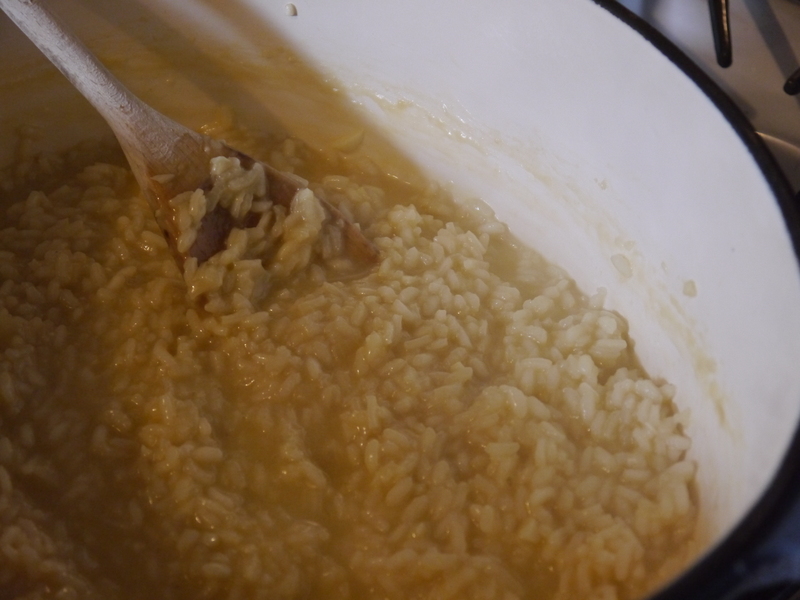 When making risotto, you ONLY add hot stock to the pot… never room temperature or cold. Make sure all your ingredients are on-hand and ready to go! Heat the butter and olive oil in a very heavy-bottom pot over medium heat (my preferred vessel for risotto is ALWAYS the Dutch Oven). Add the shallot and cook until clear, but not browned. 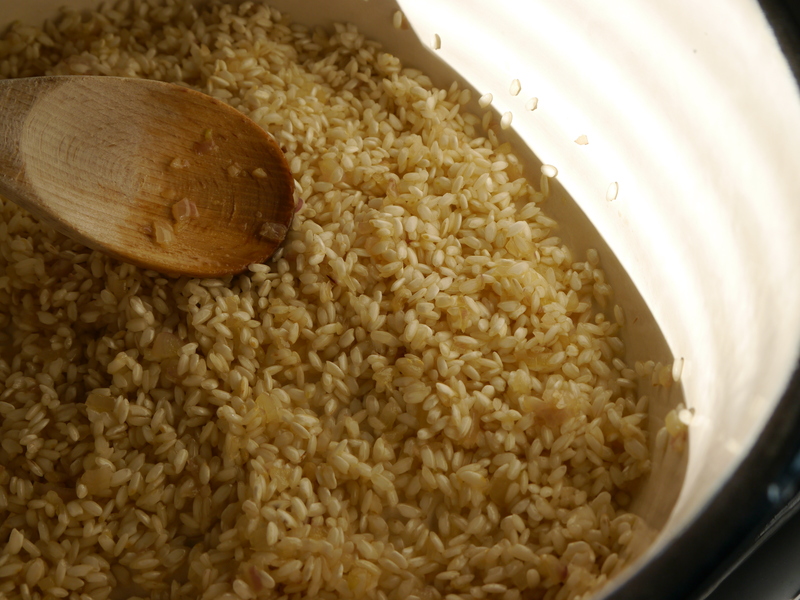 Add the rice and continue to cook (stirring the entire time) for around 2 minutes. Add the wine (stand back because this will produce a lot of steam). 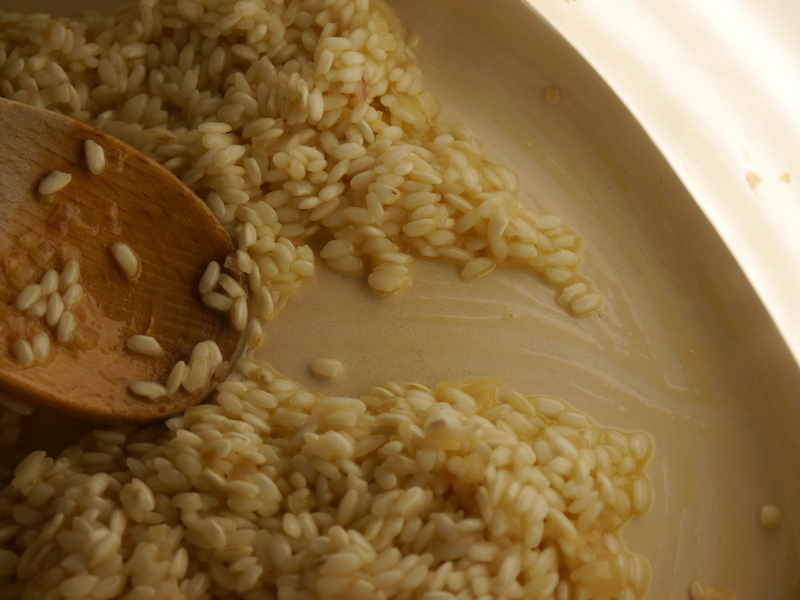 Stir until the wine has been absorbed by the rice. 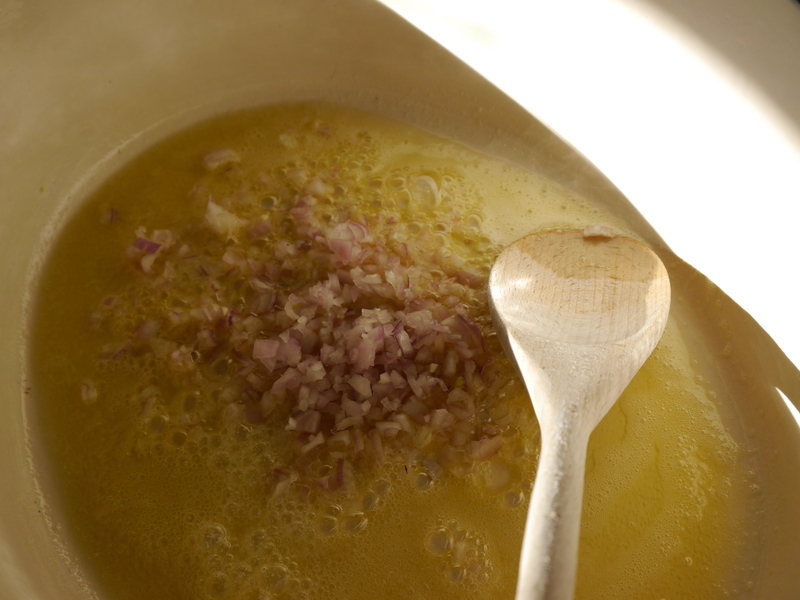 Add the garlic and stir before adding your first cup of stock to the mix. You will be able to tell that the liquid has been absorbed when you can’t see any in the bottom of the pan. From here, you will add one cup of hot stock to the rice at a time, stirring after each addition and allowing it to cook until the liquid has been absorbed before you add more. In the meantime, divide the corn in half. Put half of it in the blender or food processor with a few tablespoons of liquid and some thyme or basil (whichever you are using). 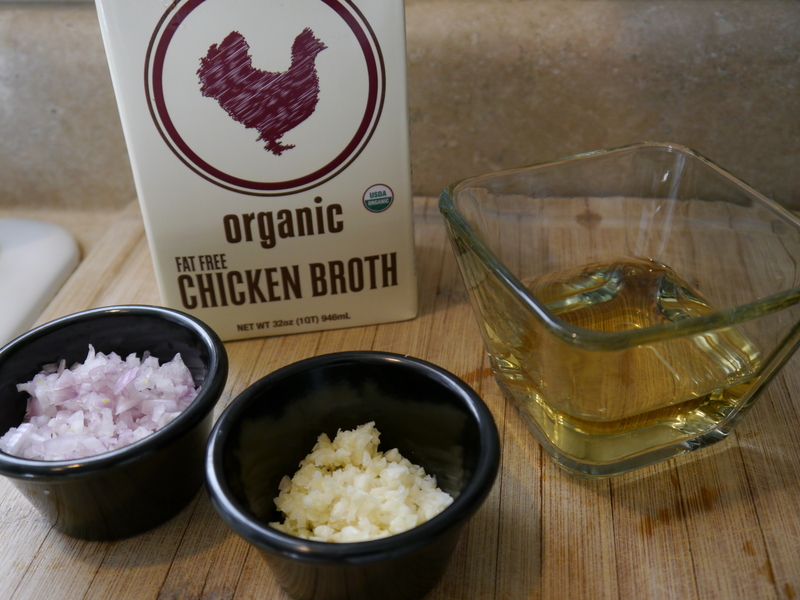 I used milk, but you could use some of the stock if you were keeping this recipe dairy-free. 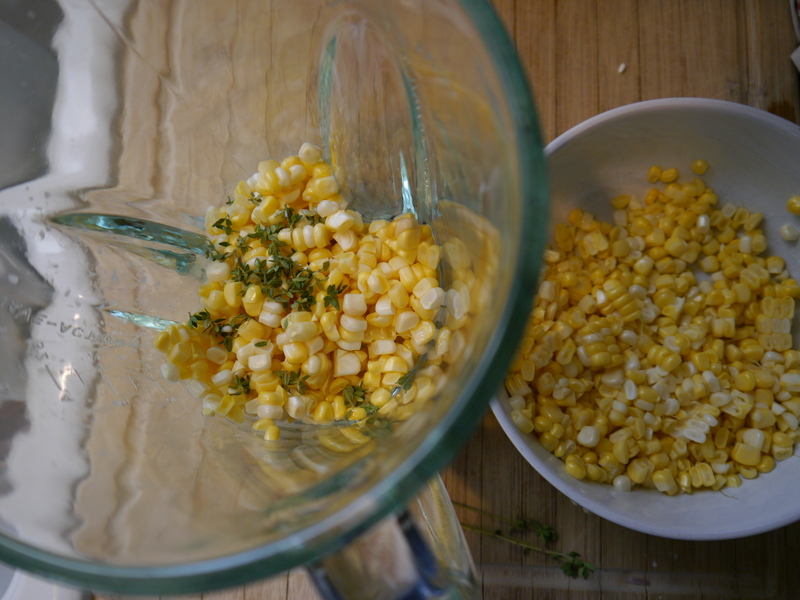 Blend or process the corn until fairly smooth and put it aside. 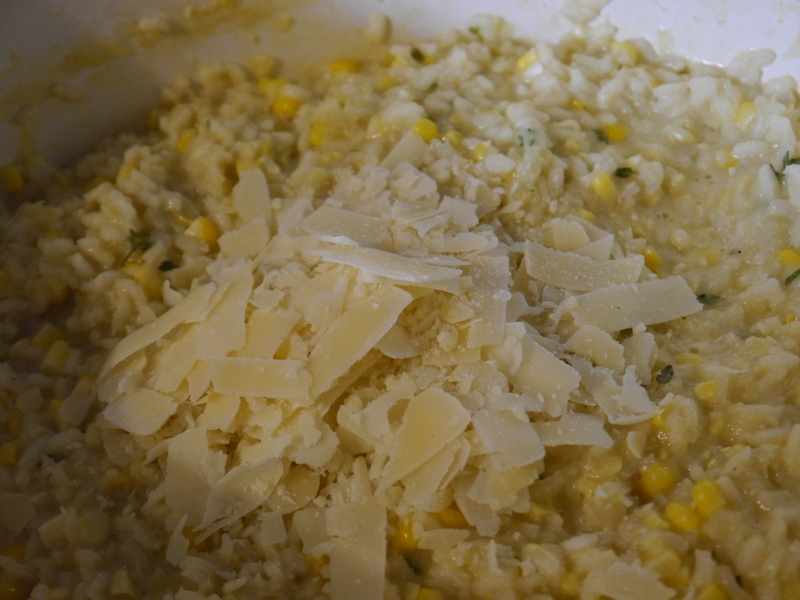 It takes about 30 minutes to complete the risotto. 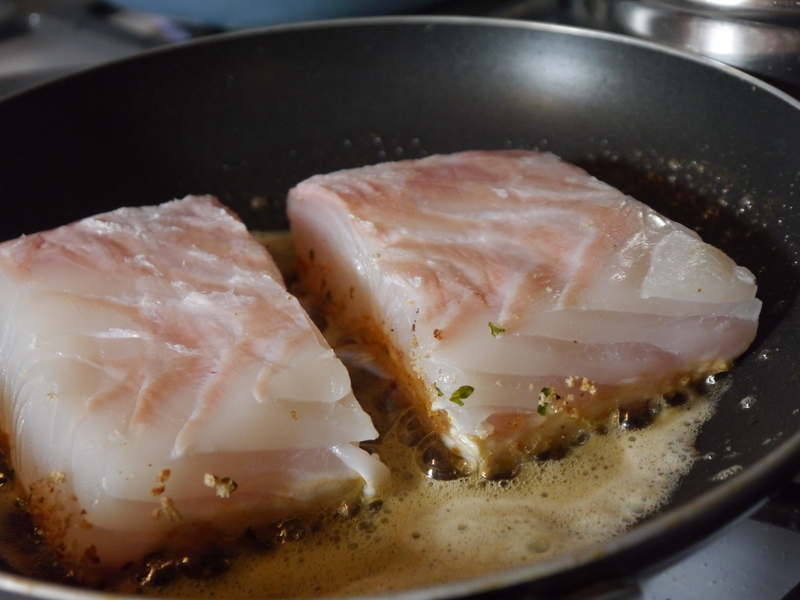 During this time, I prepared my Halibut. Preheat the oven to 350 degrees. 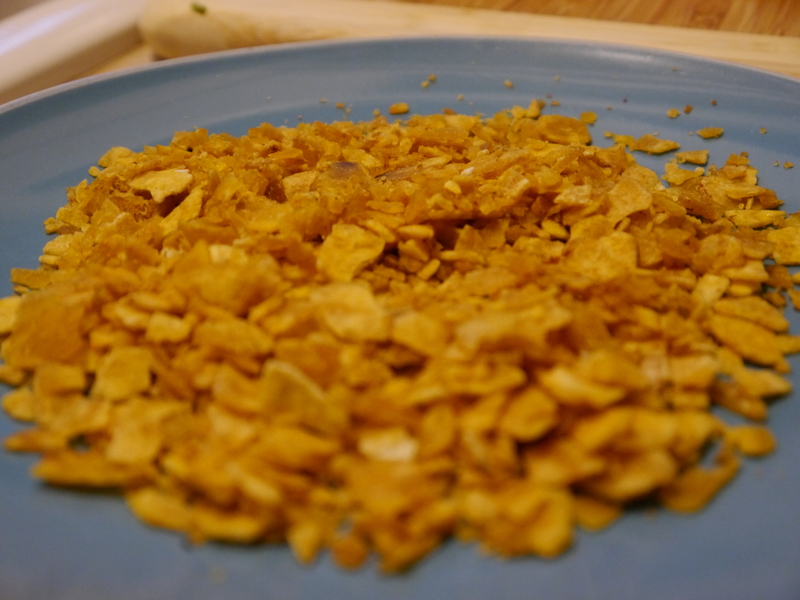 I portioned it and dipped the top side into an egg wash (one egg and a tablespoon of milk or water) and then dipped it into the breadcrumbs. 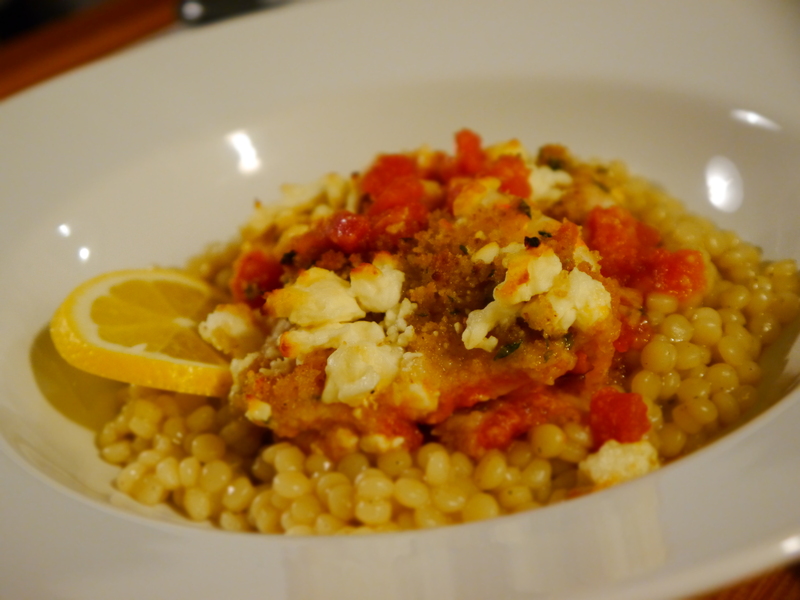 I used a seasoned whole wheat breadcrumb that I had on-hand. I like the crust created by the breadcrumb, but I really don’t like my entire piece of fish breaded unless I’m deep frying it. 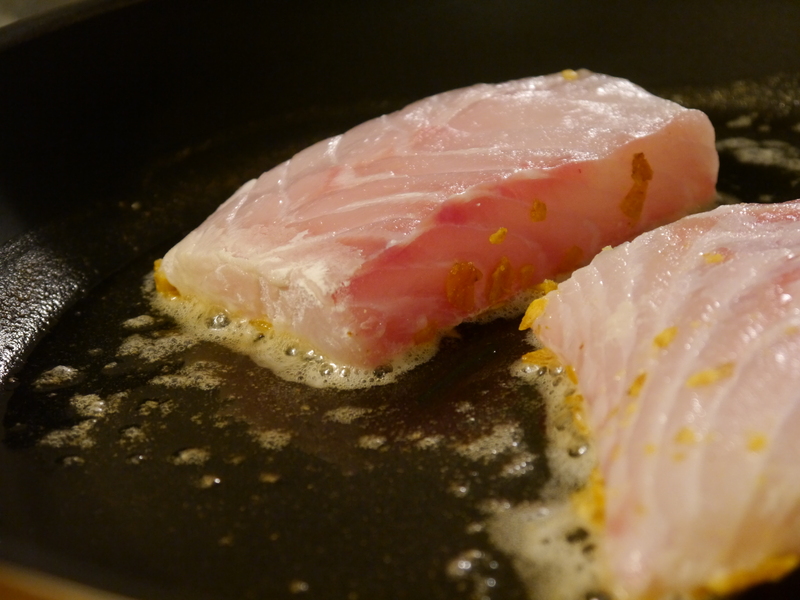 Heat some butter or olive oil in a pan over medium-high heat and get ready to sear your fish. 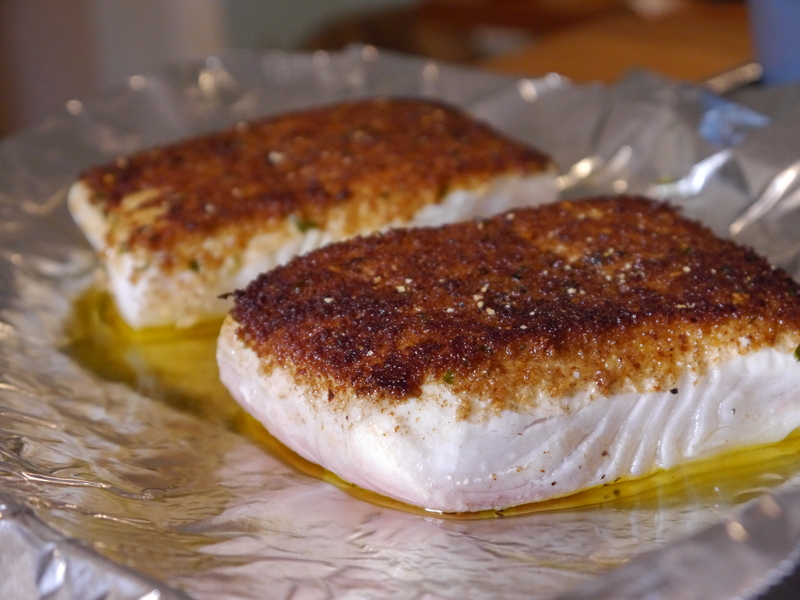 Carefully place the fish, crumbs down, into the hot pan and DO NOT MOVE it. Allow it to cook for a minute or two before gently lifting the edge to check for desired ‘brownness’. 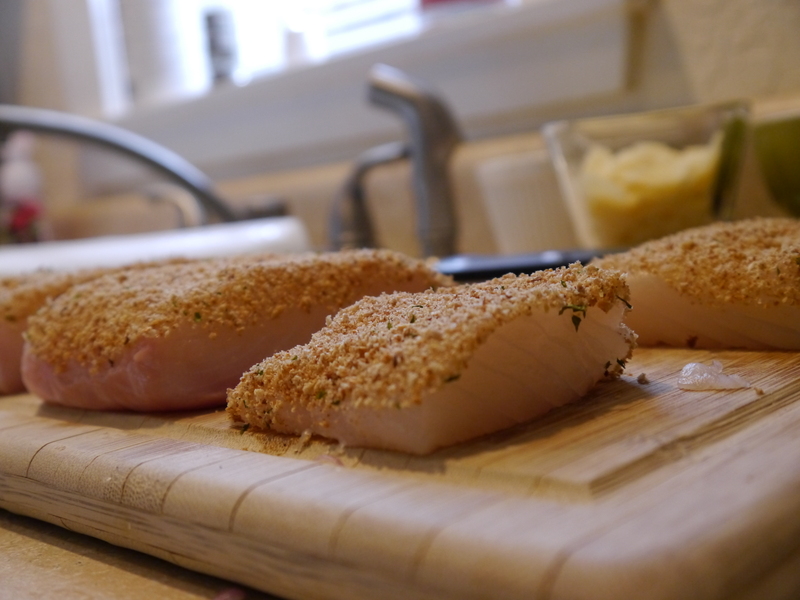 Carefully remove the fish and place it onto a prepared baking sheet crumb side up. Transfer it to the oven to allow it to finish cooking all the way through. 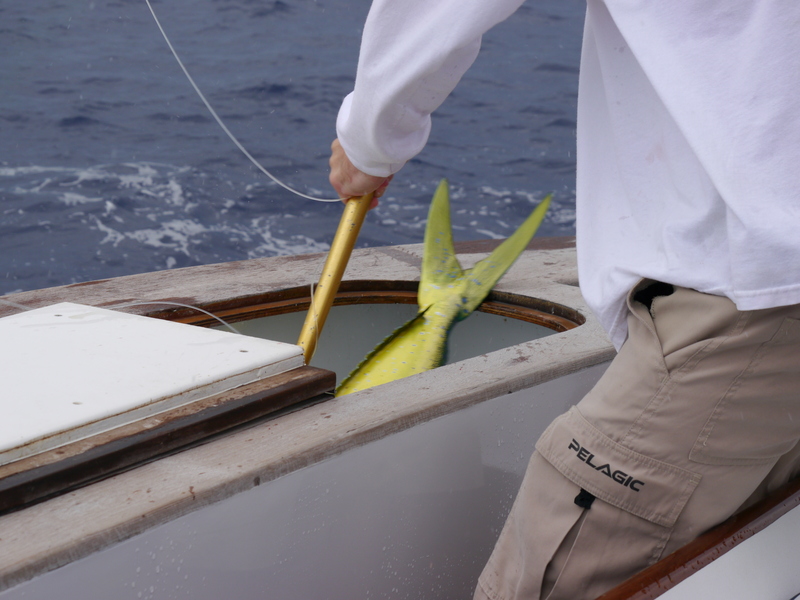 How long this takes will depend on the thickness of the fish you have. Mine took about five minutes. 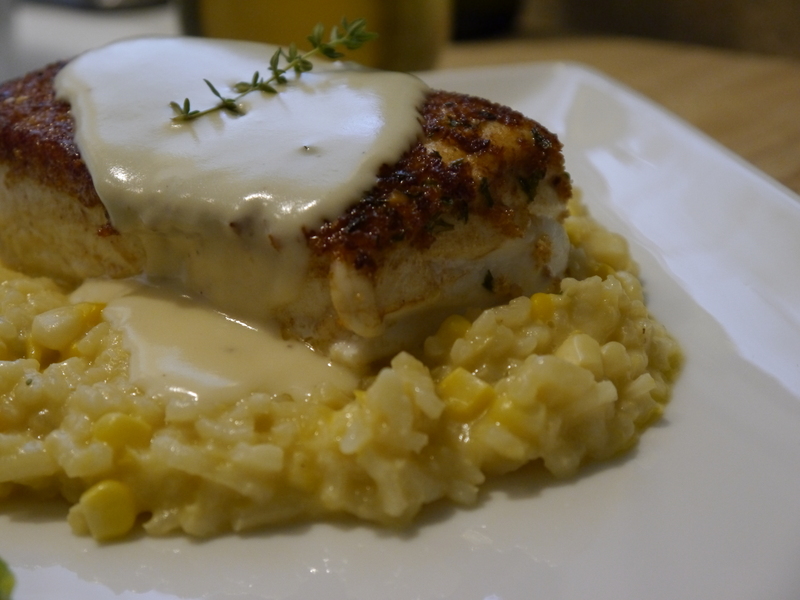 While the fish is finishing up, go back to the risotto. 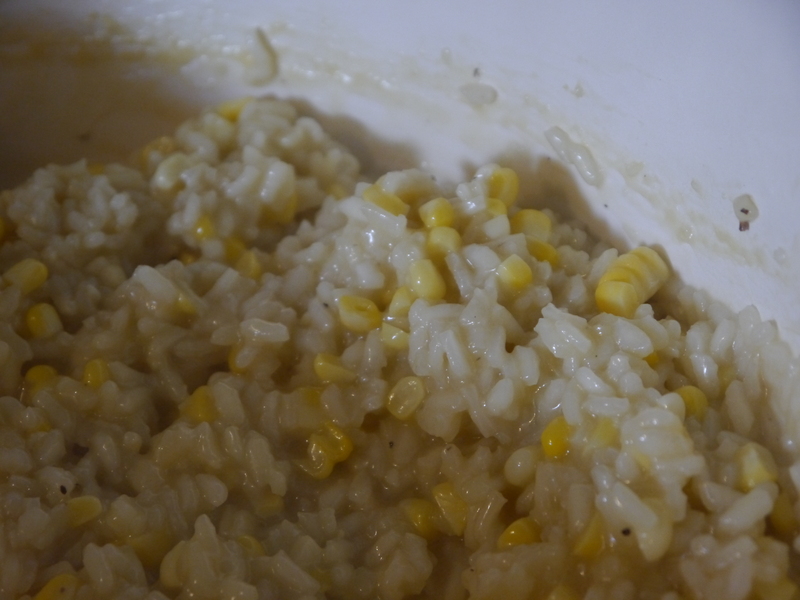 When almost all the liquid has been absorbed and the rice is almost cooked through, add the corn. Allow it to cook for a few minutes. 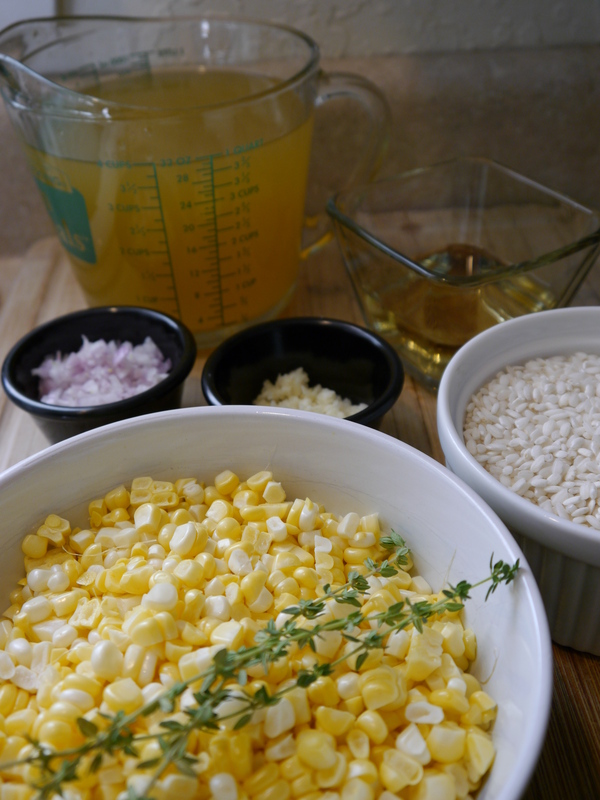 Add the blended corn and allow it to cook for a few more minutes. 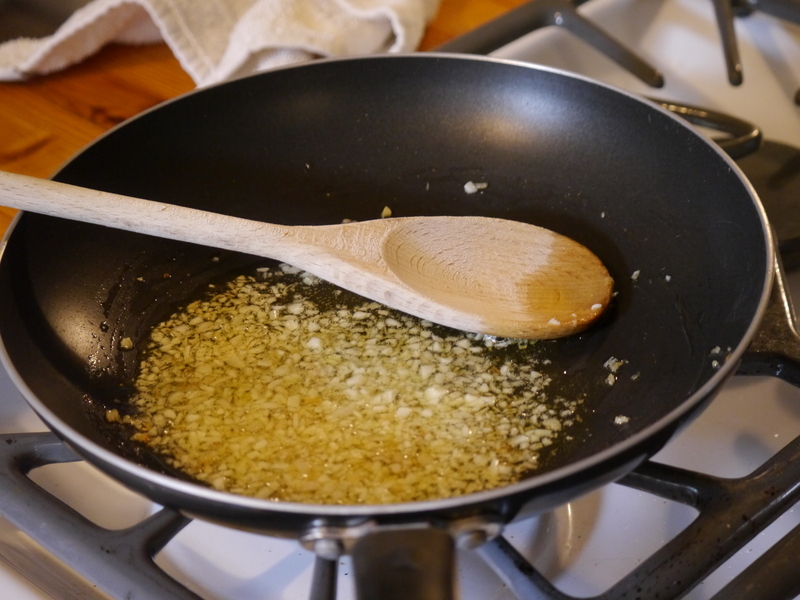 Remove from heat and stir in the Parmesan cheese and any additional herbs you’re using. Cover until you’re ready to serve it. This is the point where I found myself with a few extra minutes and wanting something more out of this meal. 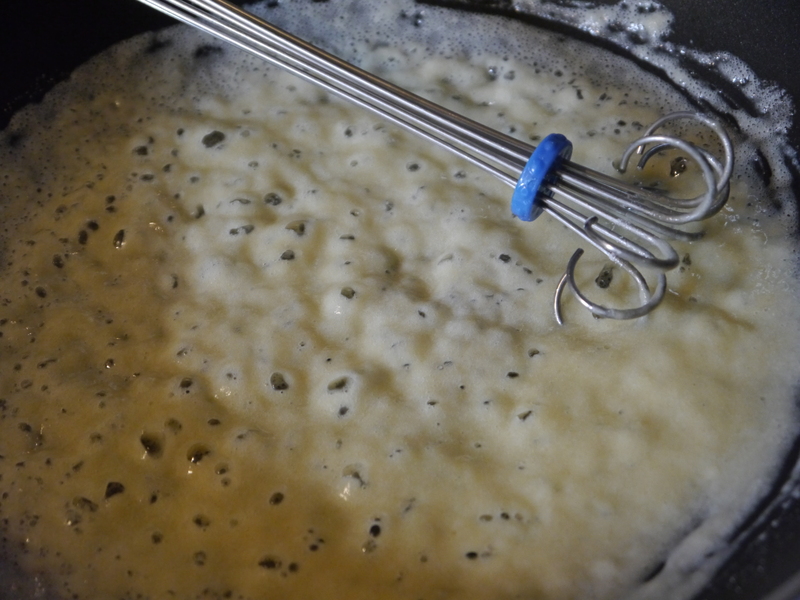 I decided to make a very quick Truffle Cream Sauce. I am a chronic anti-measurer in the kitchen, so this is more of a ‘method’ than an exact recipe; you might find yourself needing a little more liquid than I suggested. The addition of the sauce is COMPLETELY optional. It was not necessary at all, but truffles and corn are delicious together and it really did help to tie it all together. 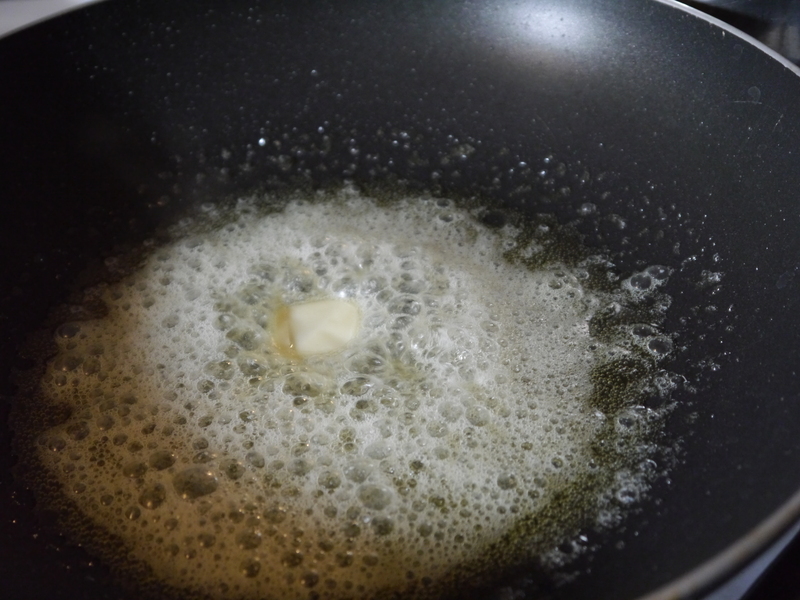 Melt the butter in a small pan over medium heat. 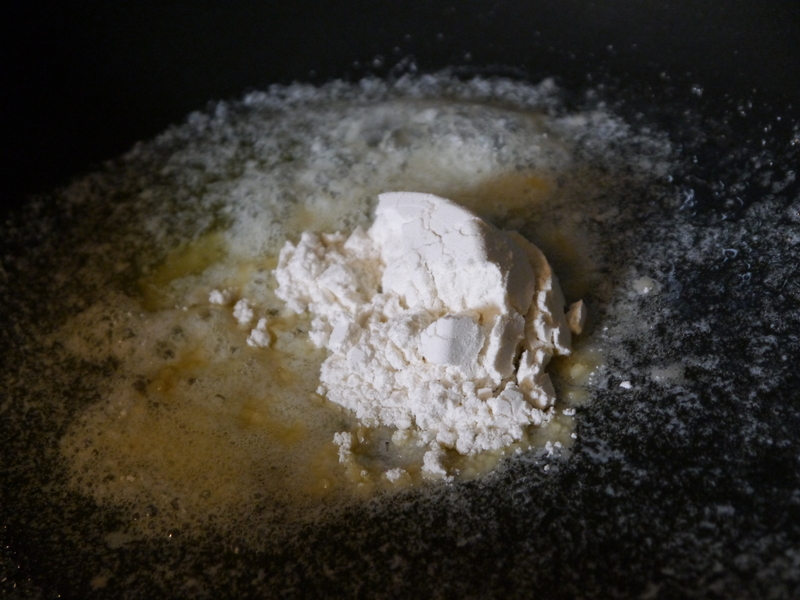 Add the flour and stir until it starts to become bubbly. Whisk in the liquid, herbs, and truffle oil. 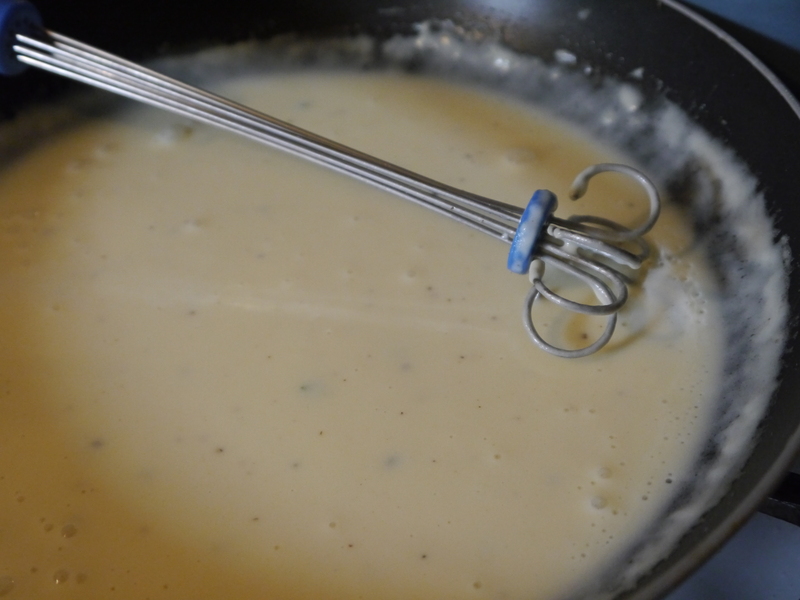 Continue whisking over medium heat until it has reached the desired thickness. Done!! This was ABSOLUTELY DELICIOUS and worth every one of the 40 minutes I spent in the kitchen. You may remember my post from a while back anticipating the arrival of some very fresh eggs. I’m pleased to say that our hens have been very busy providing us with eggs for the past two months. There are few things more rewarding than seeing the boys retrieve eggs from the coop every day. We have been using them instead of store-bought eggs, but I felt like it was time to use them for something we all REALLY enjoy. One of my personal favorite egg-containing dinners? 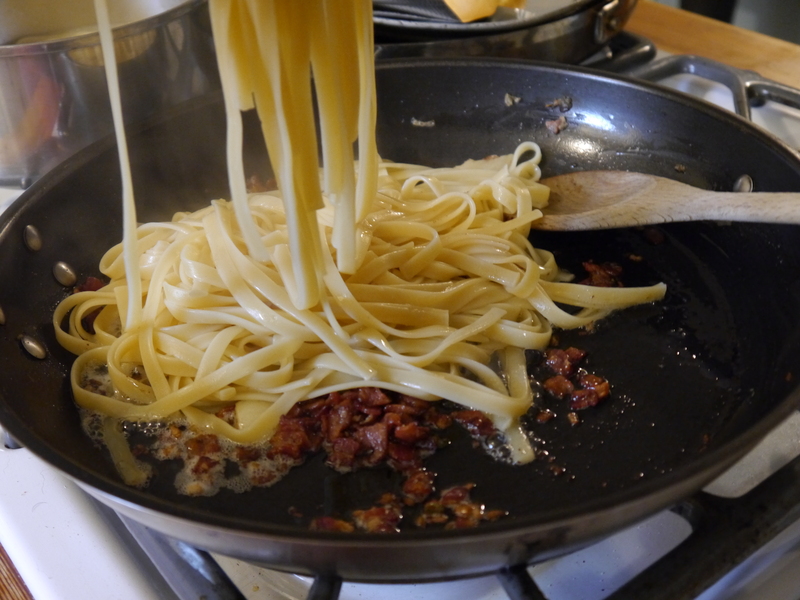 Carbonara. This simple yet traditional pasta dish can be whipped up in no time at all. 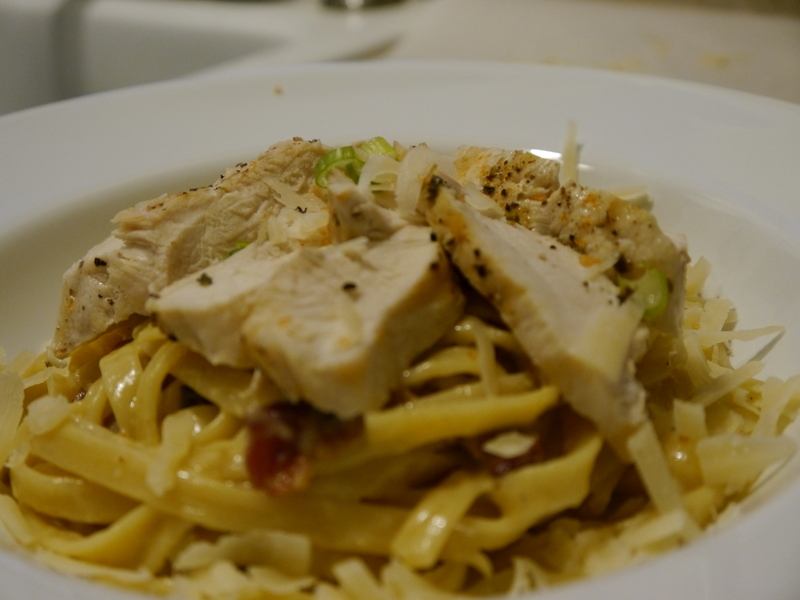 Carbonara is delicious with any sort of protein on it… and it’s delicious all on its own. 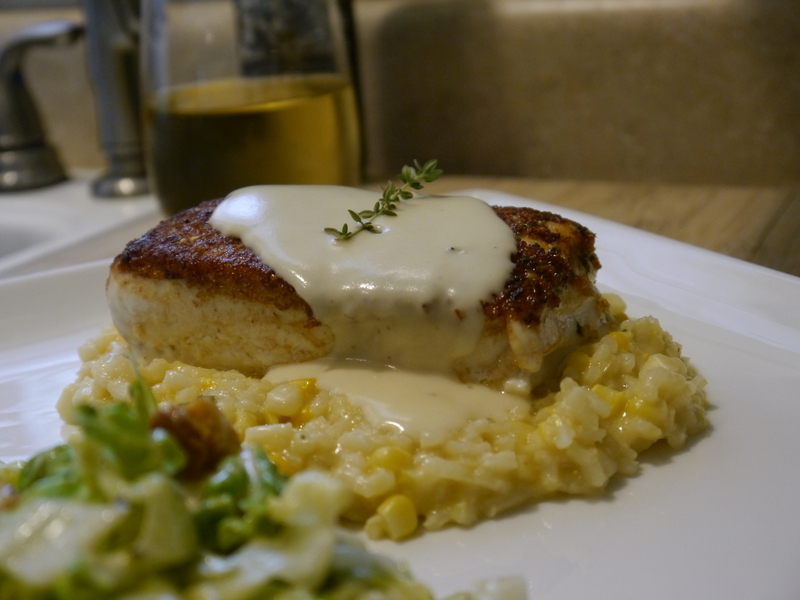 While there isn’t any seafood in this dish, the possibilities are endless. This would be great topped with shrimp, fish, scallops, or even a crab cake. (Between hurricane season and our upcoming move, we are trying to scale back our freezer stock… so I used chicken breast.) 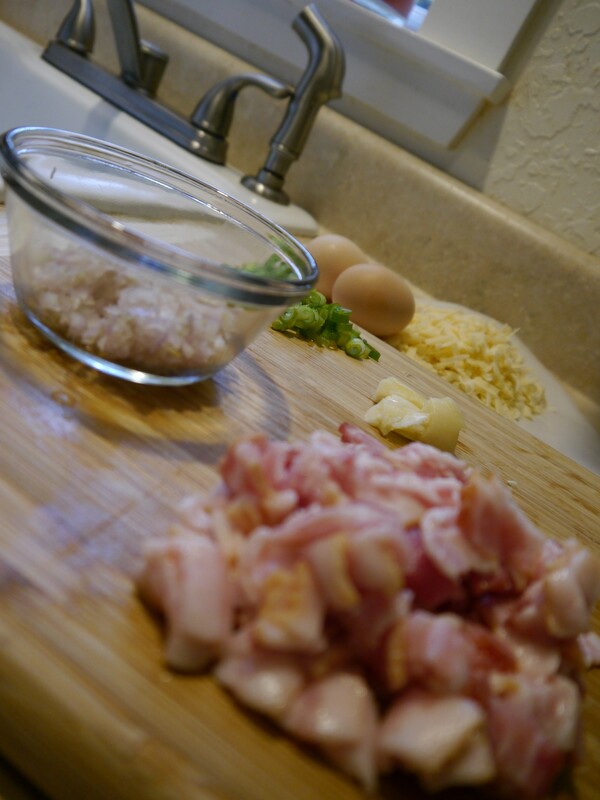 If you have made Carbonara before, you might notice that I use milk instead of cream and I didn’t include peas. 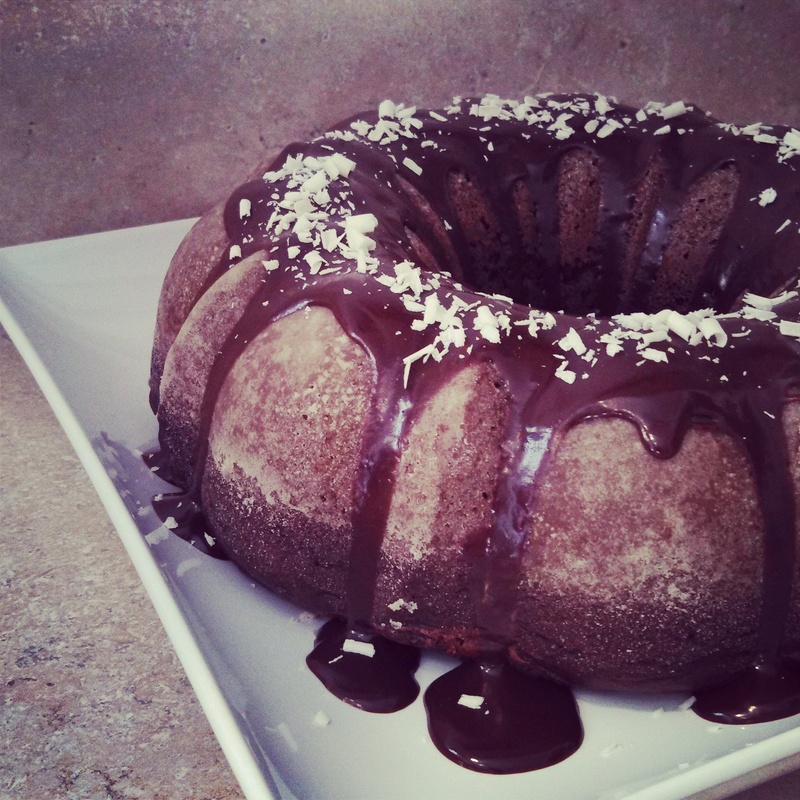 These modifications were simply based on the ingredients we had on-hand at the moment. 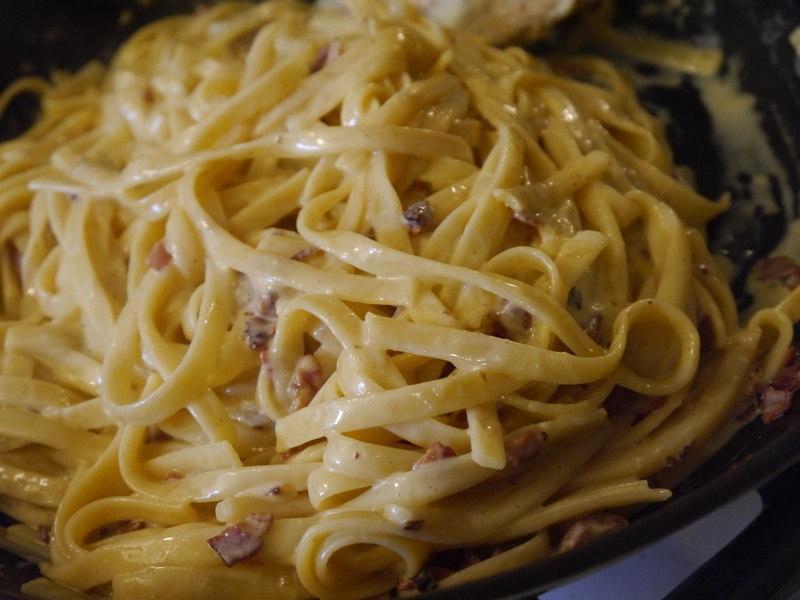 I assure you that, despite making Carbonara countless times, I couldn’t tell the difference between using milk and cream; it will save you a few calories and a trip to the store. Cook the pasta according to the instructions on the package while you are preparing the sauce. 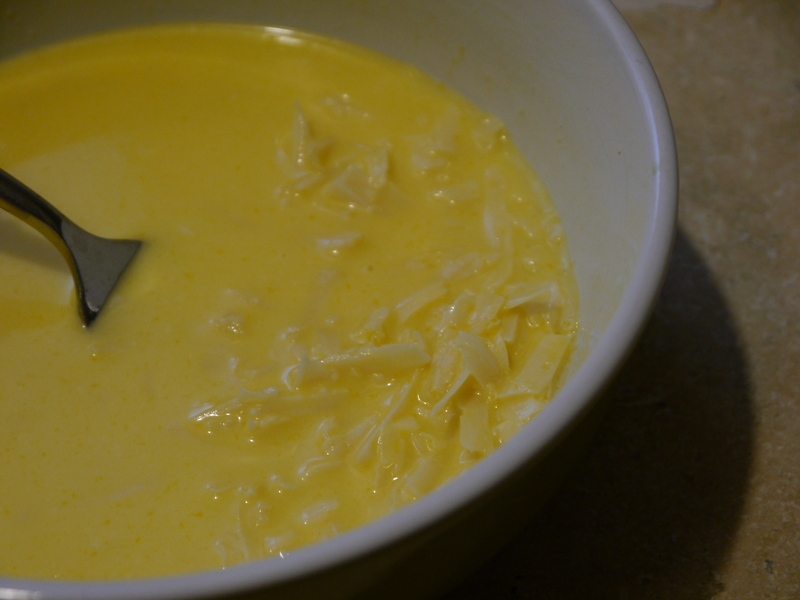 Combine the milk, egg yolks, and 3/4 cup of the parmesan cheese in a small bowl. 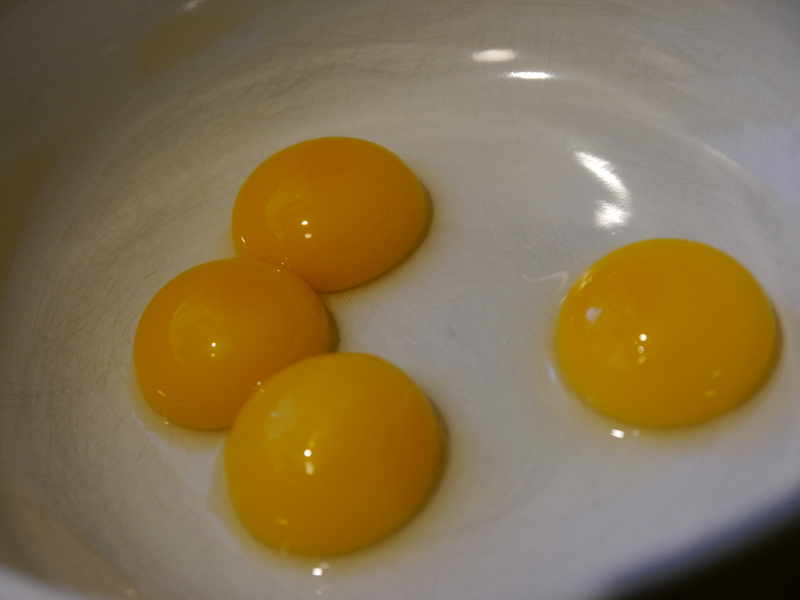 Two of our hens have been laying double-yolk eggs (this is common during their first months of producing eggs), so I ended up with four small yolks instead of two large yolks. 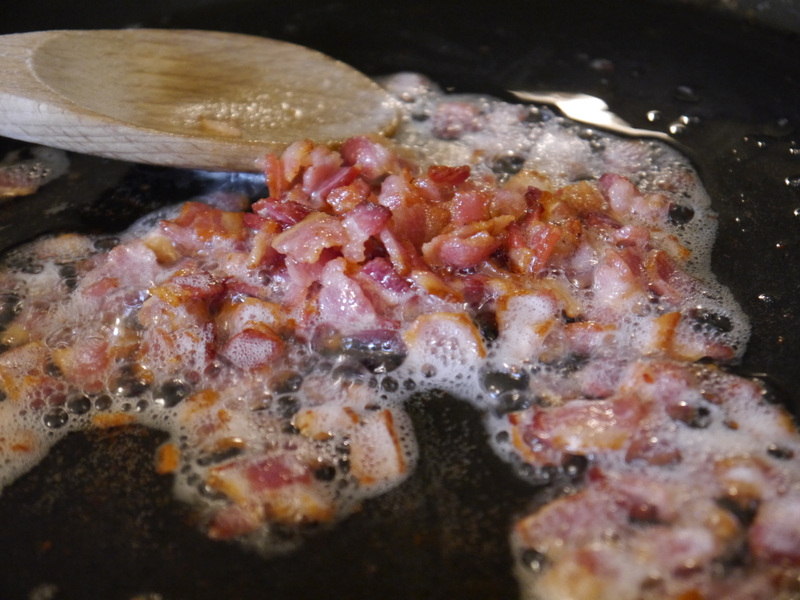 Start by cooking the bacon until it is crisp. 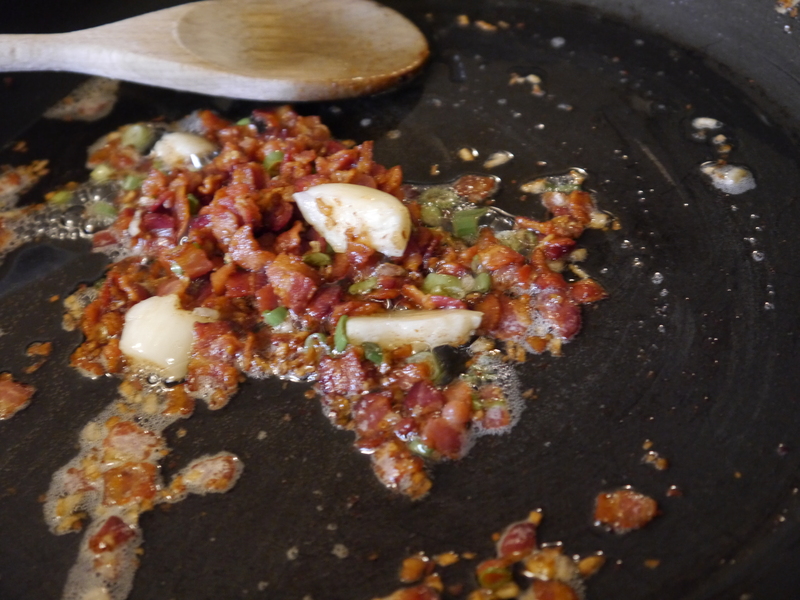 Add the shallots and continue to cook only until they are soft and clear (don’t burn them). I did this over medium heat. Add in the scallions and the garlic and continue to cook over low heat until the pasta has finished cooking and is drained. Keep the heat low and add in the hot, drained pasta. Toss to combine. 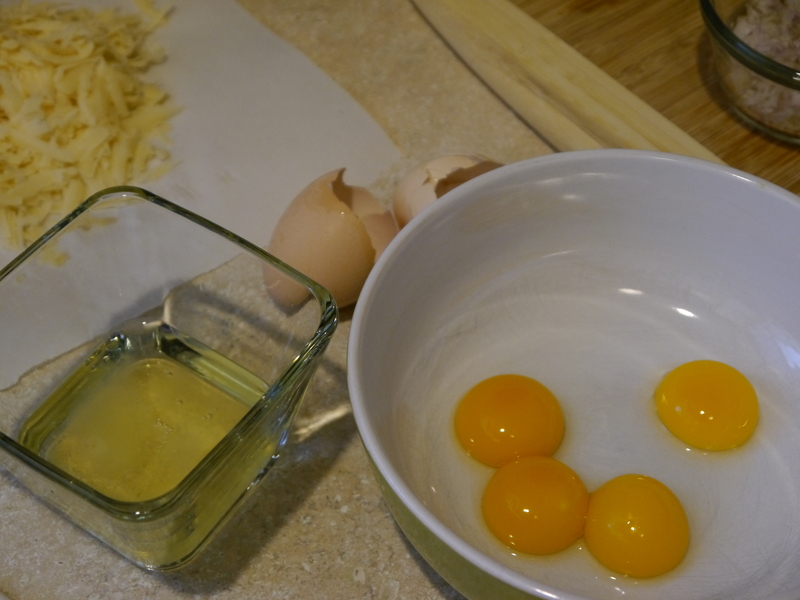 Next, add in your milk/cheese/egg mixture. Remove the pan from the heat. Work quickly to keep the pasta moving. You aren’t scrambling eggs here. 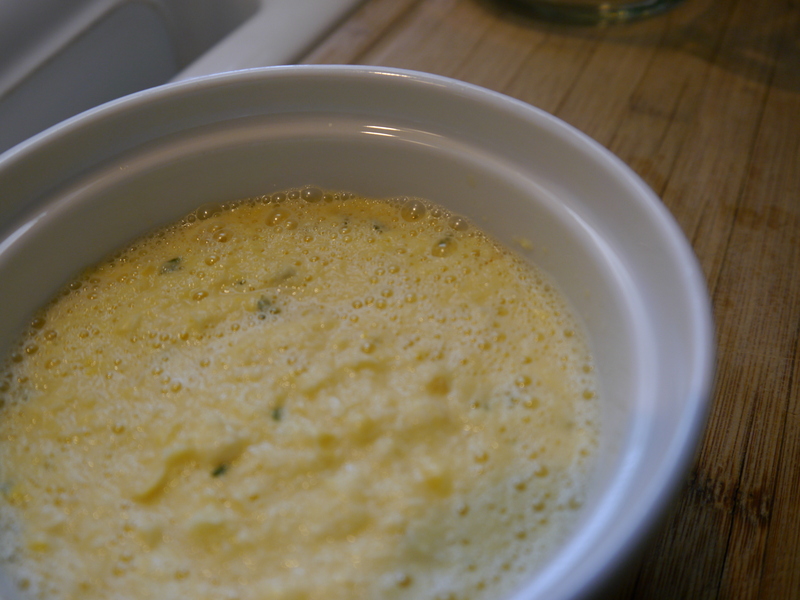 The yolks will cook and create a thick, silky sauce that is so rich and delicious. Continue tossing the pasta until it is all combined. 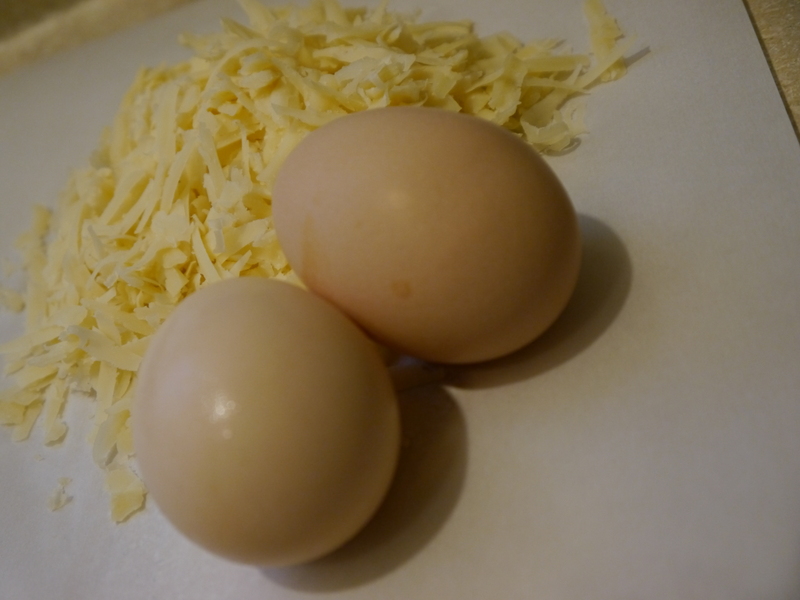 The eggs will cook and the cheese will melt into the sauce. 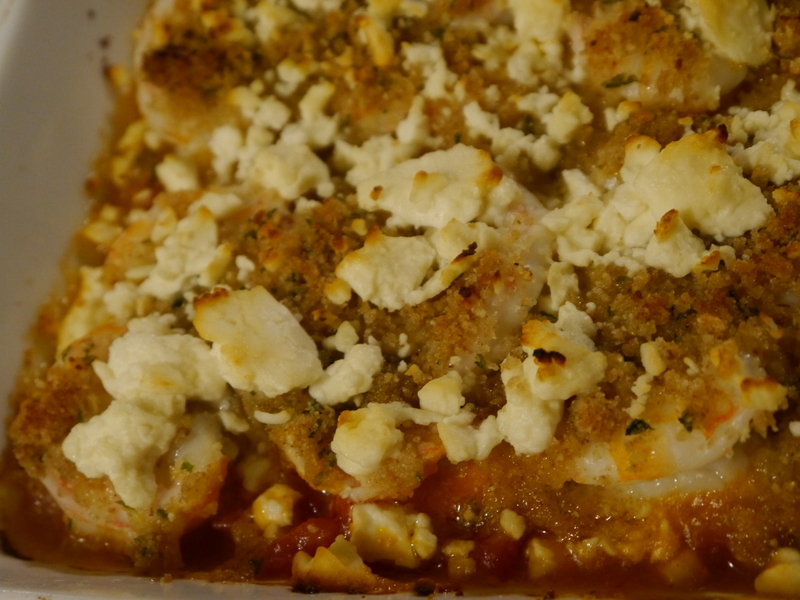 Top with your cooked fish or chicken, parmesan cheese, and more scallions. Delicious!! 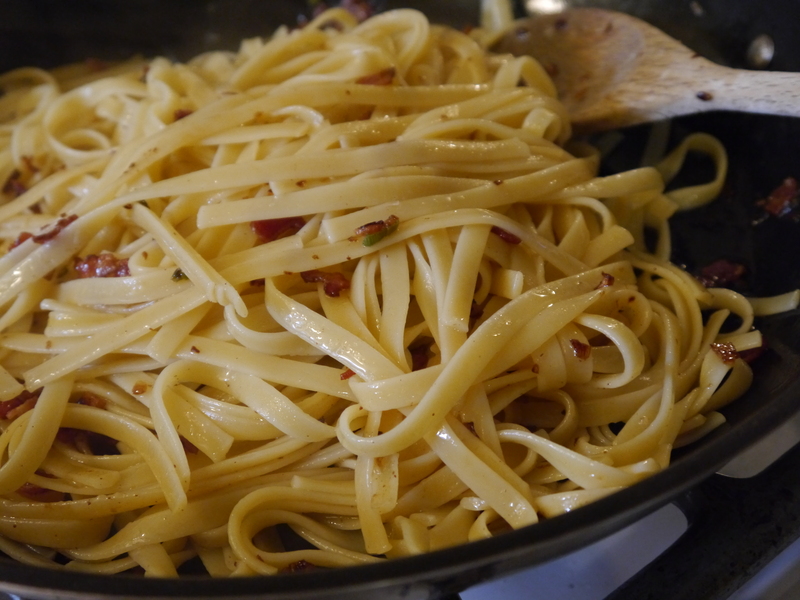 Don’t forget dessert… if you’re going to have a pasta dinner with eggs and bacon, you might as well include dessert. After a few weeks of major blog neglect, I’m happy to say that we are back… in some capacity. The last month and a half has been a whirlwind of vacation preparation, the actual vacation, and busy work schedules. Add that to preparing to move into a new house and some other pesky life interruptions and you can imagine why we haven’t been around much lately. 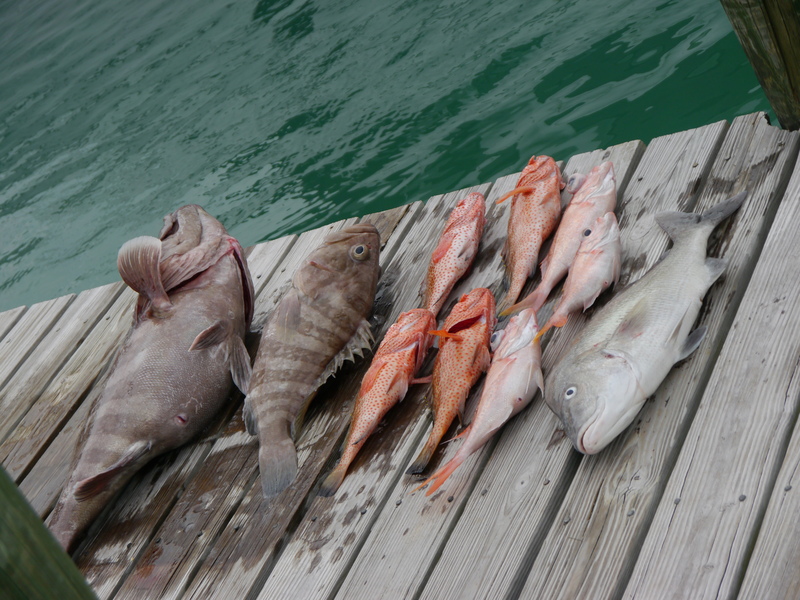 Our vacation was wonderful and, of course, filled with fish and saltwater. 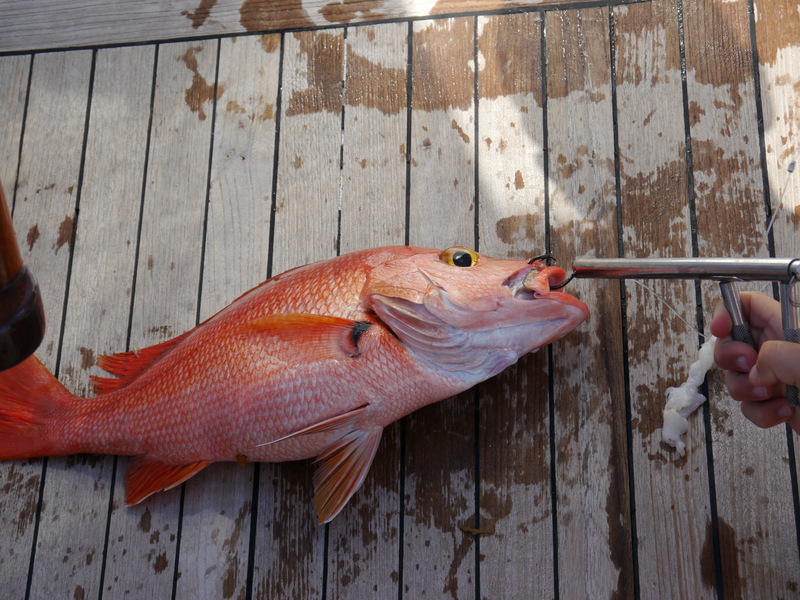 Because what is a vacation without fish? Probably not a vacation you’ll ever find us on. 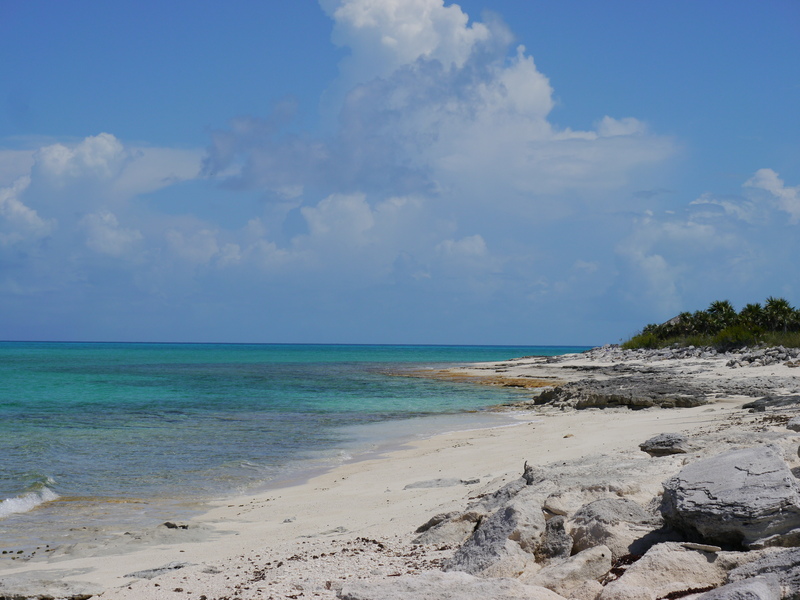 We spent about two weeks at the beautiful Cat Island in the southern Bahamas… doing what we do best. Improvised dinners are often the best. Everyone has those days when you raid the pantry to see what you can possibly pull together with what you have on hand. That is usually how my best ideas are born. 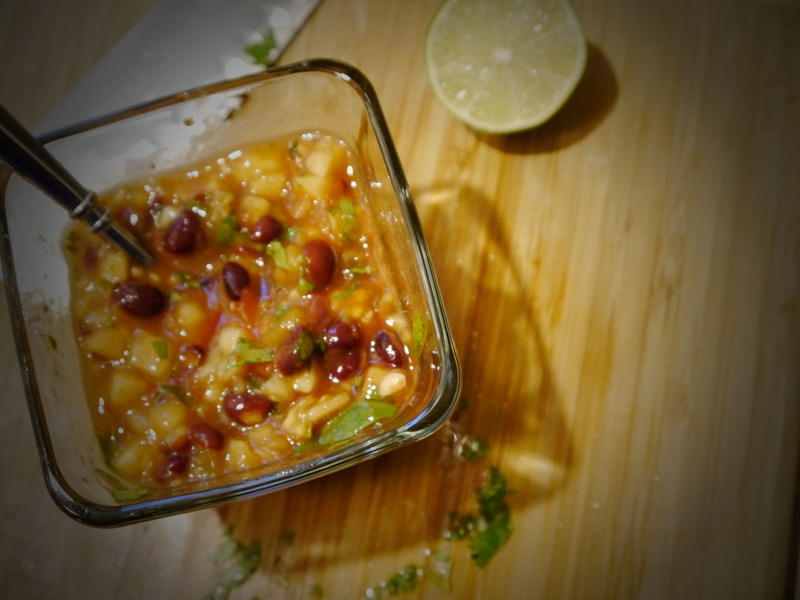 I started with a jar of All-Natural Black Bean Salsa. It is good, but it needed some help. 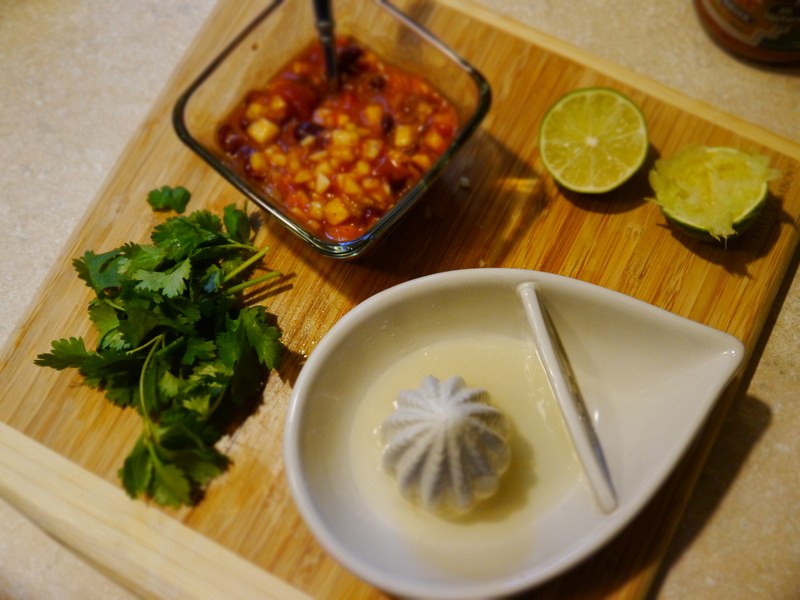 Fresh diced pineapple, fresh cilantro, lime juice, and fresh garlic helped to brighten it up. You really can’t go wrong here… mango would be delicious if pineapple isn’t available. 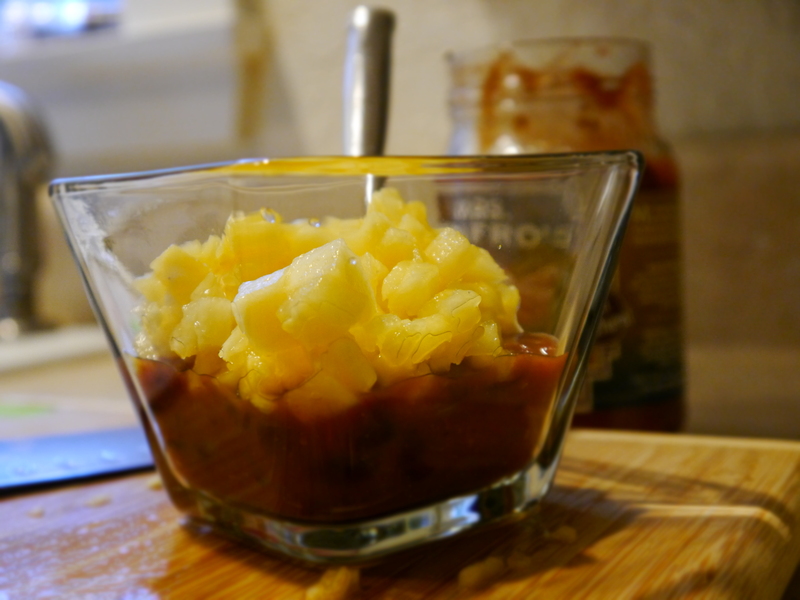 If you want, you can even BUY pineapple salsa or use whatever you have on hand. 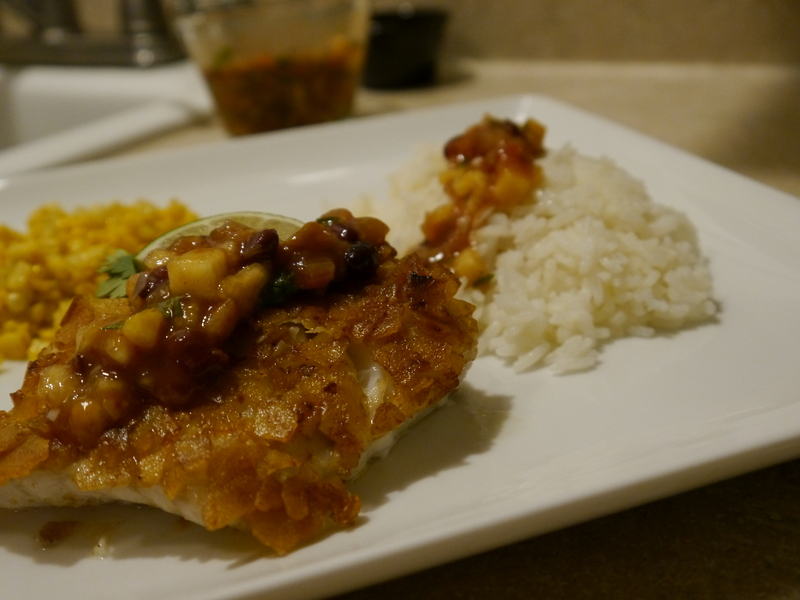 After I made the salsa, I set it aside while I prepared the fish. 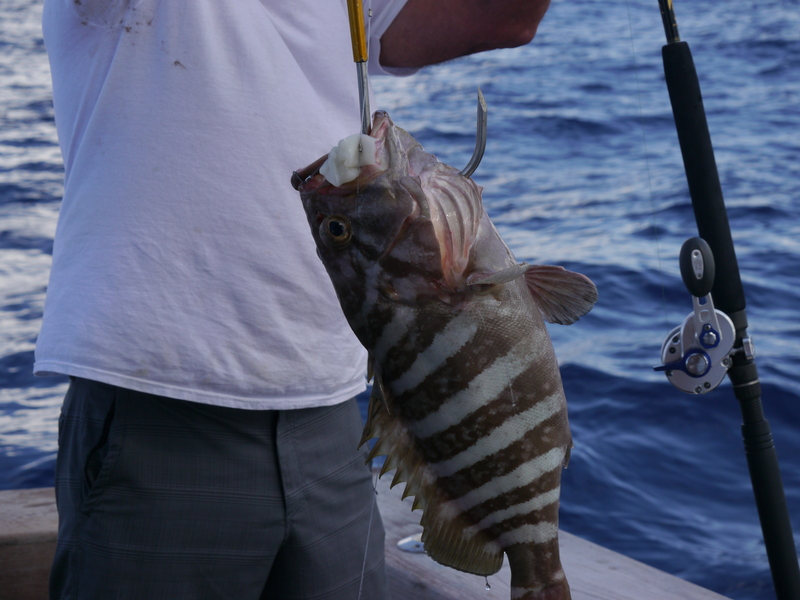 You’ll need some delicious fresh Grouper (this would be great with any white fish… especially Mahi or Snapper). 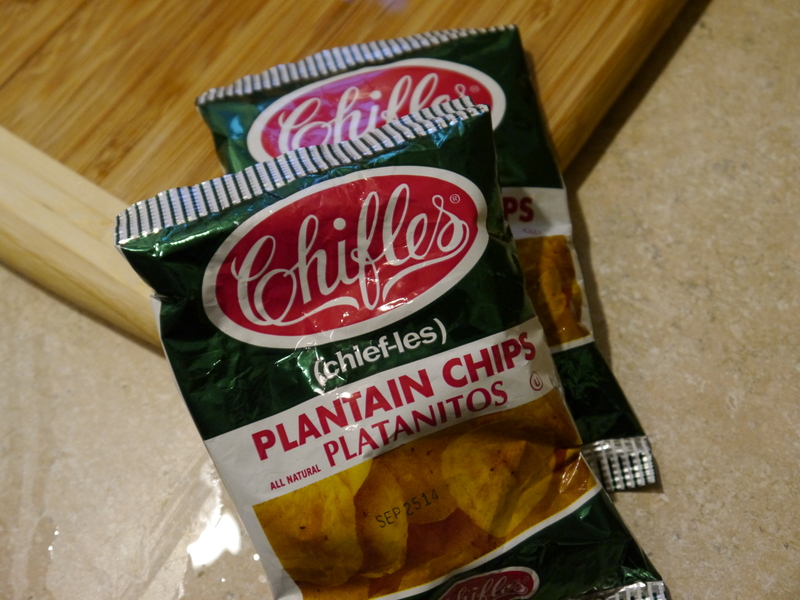 I had some tiny kitchen helpers crush plantain chips for me. 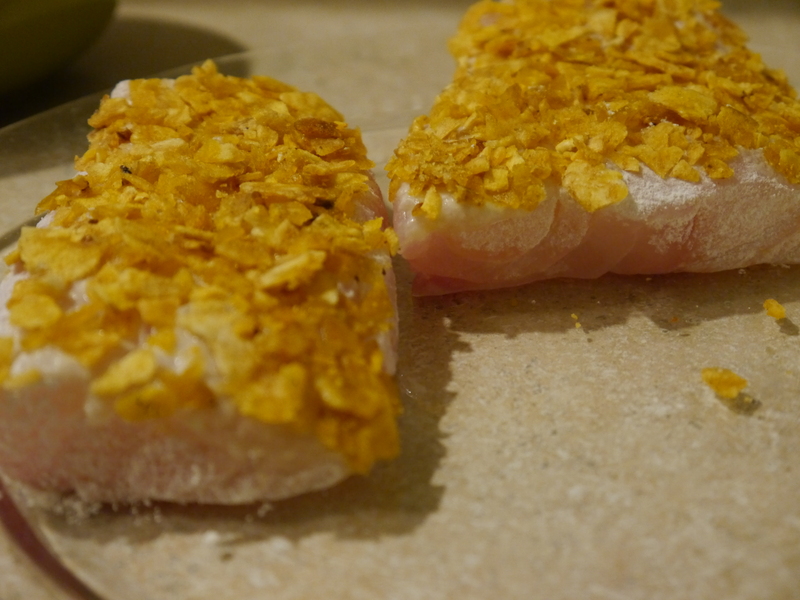 I coated ONLY the top side of the fish portions in flour, egg wash, and crushed plantain chips. You can coat the entire portion if you’d like, but it really isn’t necessary. 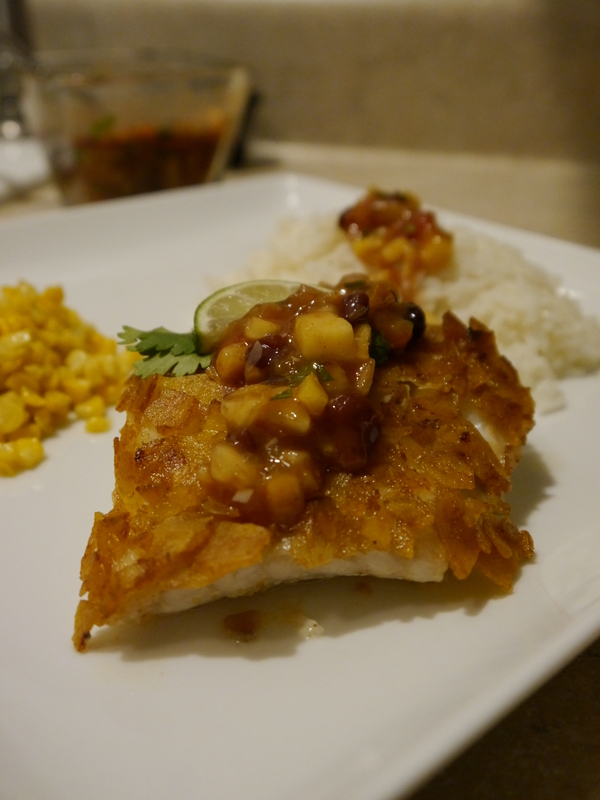 Top the fish with the salsa and you’re ready to eat! 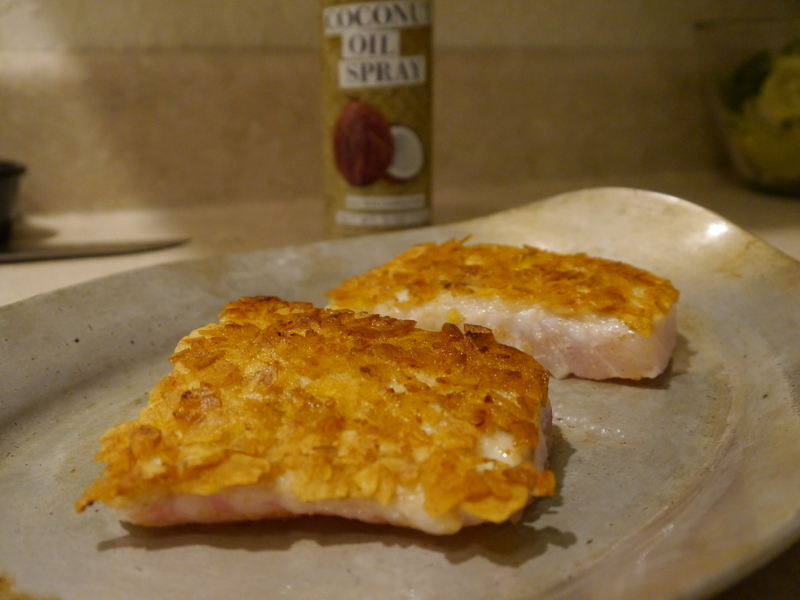 I served this with coconut Jasmine rice (just replace half of the water with coconut milk). It’s like being somewhere in the tropics when you’re really at home! Tender shrimp roasted over a bed of tomatoes and wine is taken to another level with tangy Feta cheese… you won’t want to miss this one! 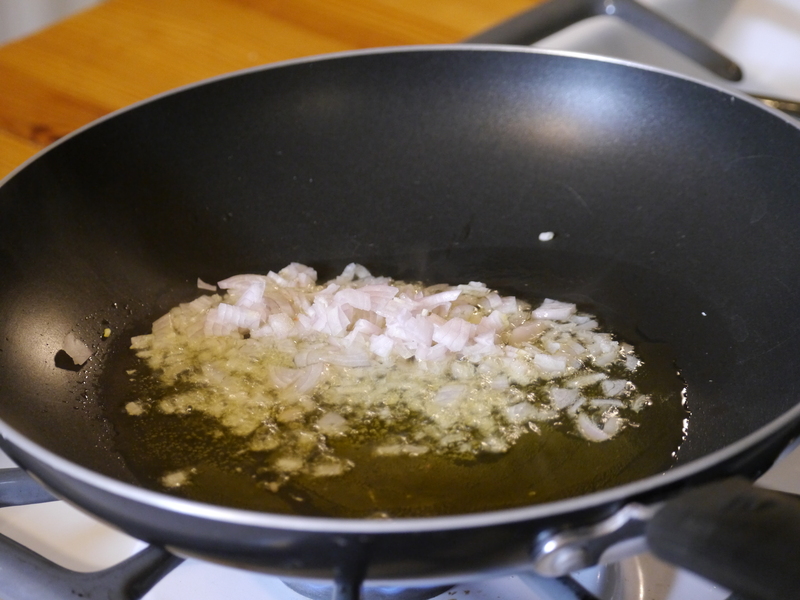 Over medium heat, cook the shallot in 2 tablespoons of olive oil. 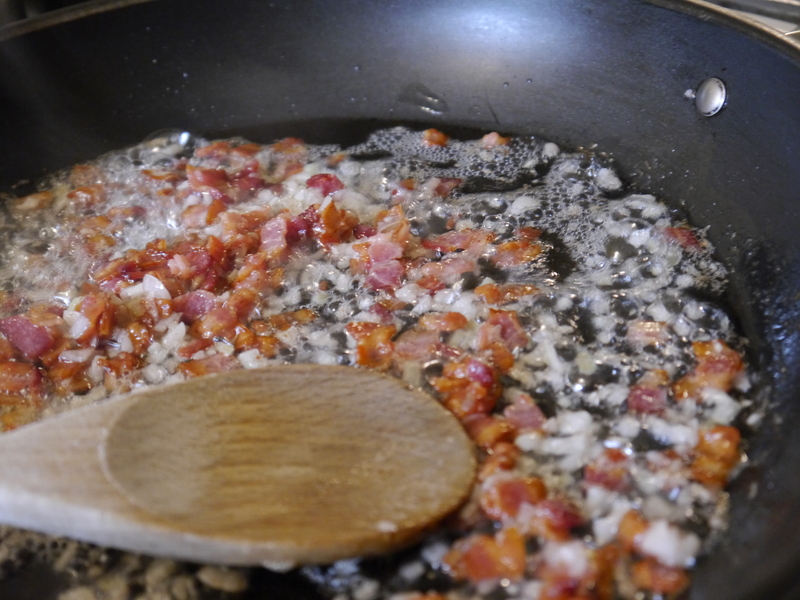 Once the shallot becomes soft, add the garlic and cook for an additional minute. Add the wine to the pan and cook for about 4-5 minutes or until the wine is reduced by about half. 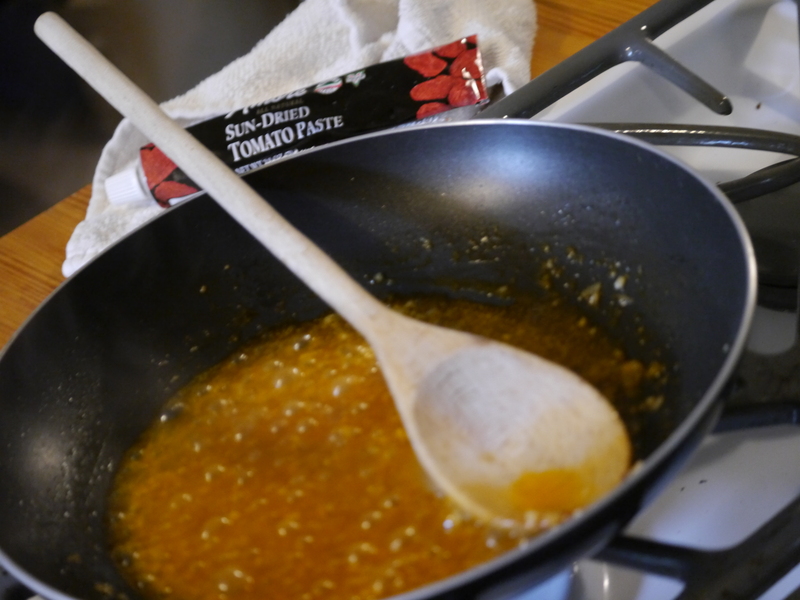 Add the tomato paste (the variety found in gourmet markets in the little tube is EXCELLENT because you don’t waste any). Add the tomatoes and lemon juice. Simmer for about 5 minutes. 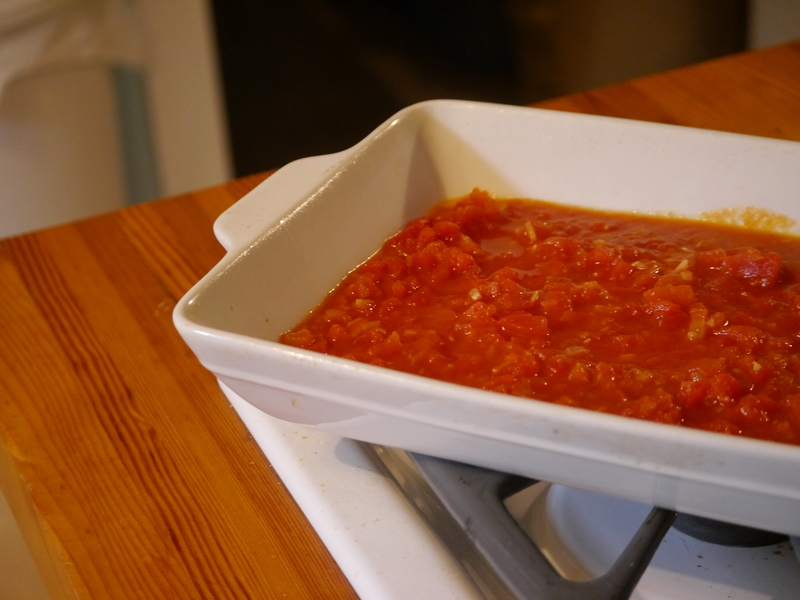 Transfer the tomatoes to a baking dish. 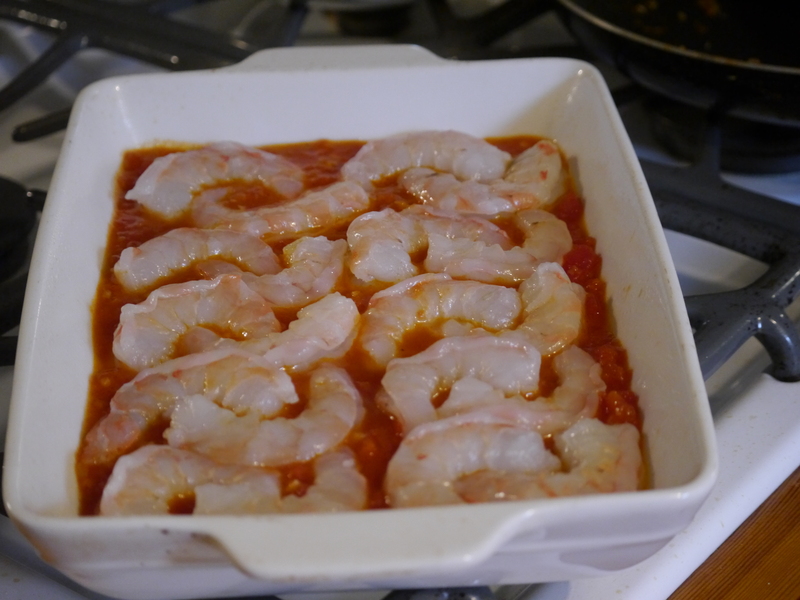 Arrange the shrimp over the top of the tomatoes, making sure that there is only one layer of shrimp. 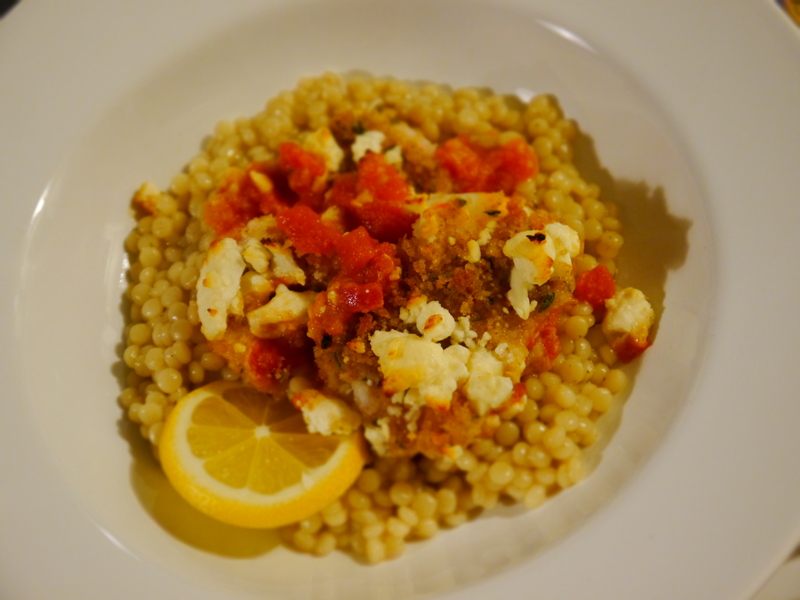 We served this over pearled couscous. It would be great over any couscous, pasta, quinoa, or even alone. This was a nice break from the usual. It was ready in about 30 minutes and it’s so versatile! You can add olives, onions… anything!